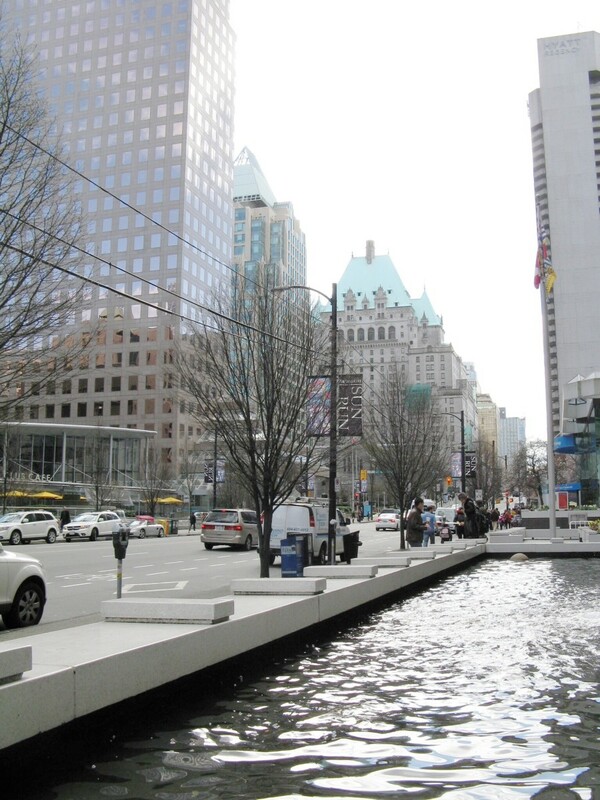 I always enjoy walking through downtown Vancouver in British Columbia. Every time I visit the area I see something new. It's a lovely place to explore and to photograph at any time of the year, but spring has special attractions. The city of Vancouver has a very picturesque location. It lies right beside the ocean and close to mountains, which form a backdrop to the city. In spring new flowers and leaves appear, cherry blossoms provide a beautiful splash of colour, and events such as the Climb The Wall competition and the Vancouver Sun Run take place. 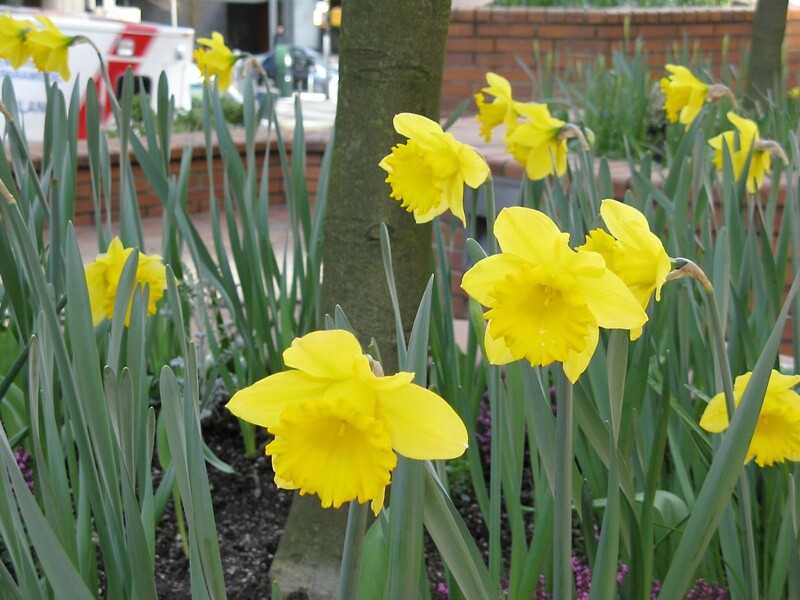 This article describes the highlights of my visit to downtown Vancouver on a day close to the spring equinox—the first day of spring. The sky was filled with mixed sun and cloud and there was a cold, penetrating wind, but spring was in the air. I've also included a few photos taken later in April. All of the photographs in this article were taken by me. 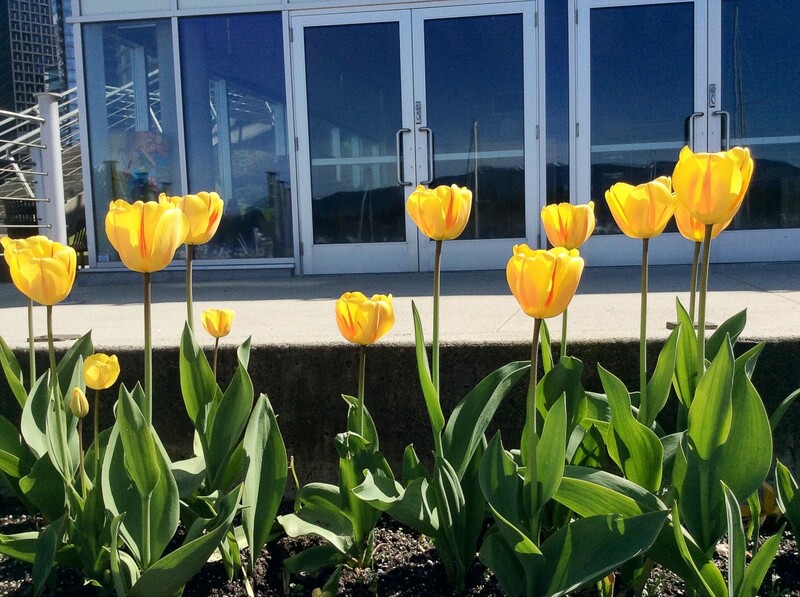 Spring comes early to the southwest corner of British Columbia. 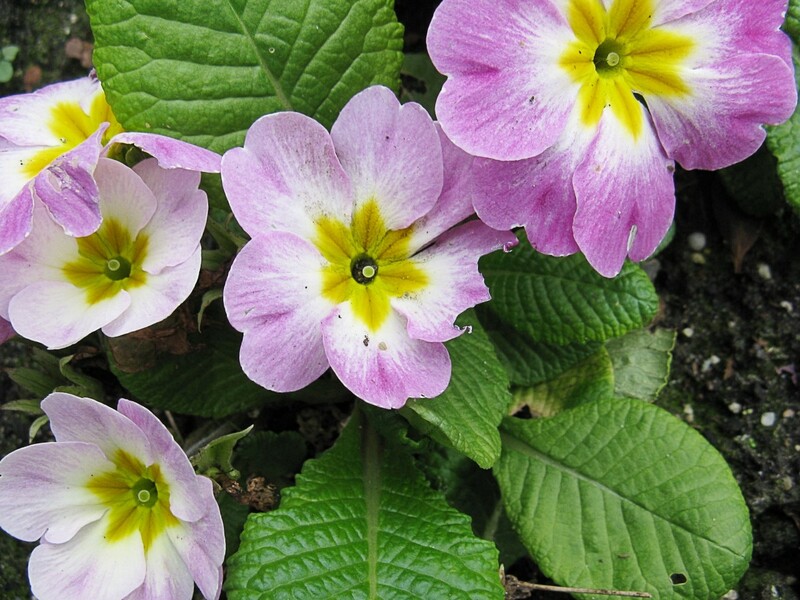 By March 20th or 21st, the usual date of the spring equinox, some birds have started to sing and the first wild flowers of the season are in bloom. 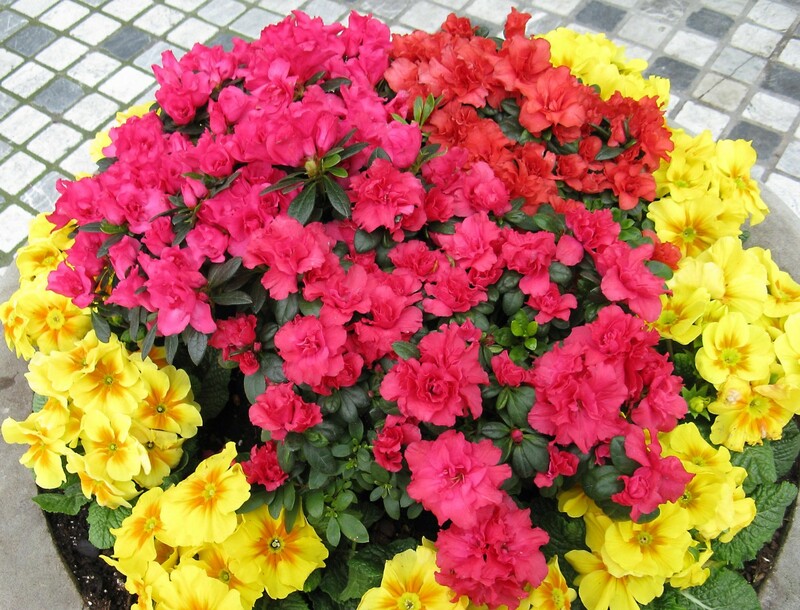 The relatively mild climate compared to the rest of Canada allows cultivated plants to thrive in downtown containers and flower beds. I started my March visit to the downtown area at the Waterfront SkyTrain station on West Cordova Street. SkyTrain is a light rapid transit system. 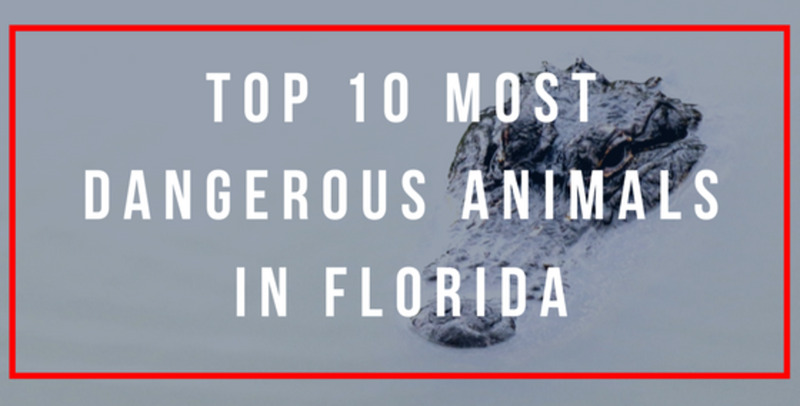 It travels mostly above ground, but in the downtown area it's forced to run below ground level. 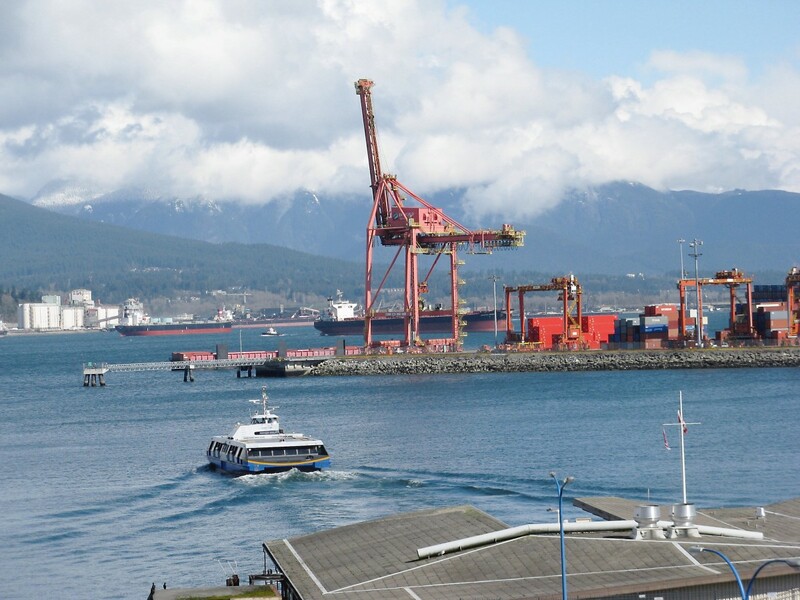 As its name suggests, the Waterfront station is located beside the water—in this case, Burrard Inlet and the Port of Vancouver. 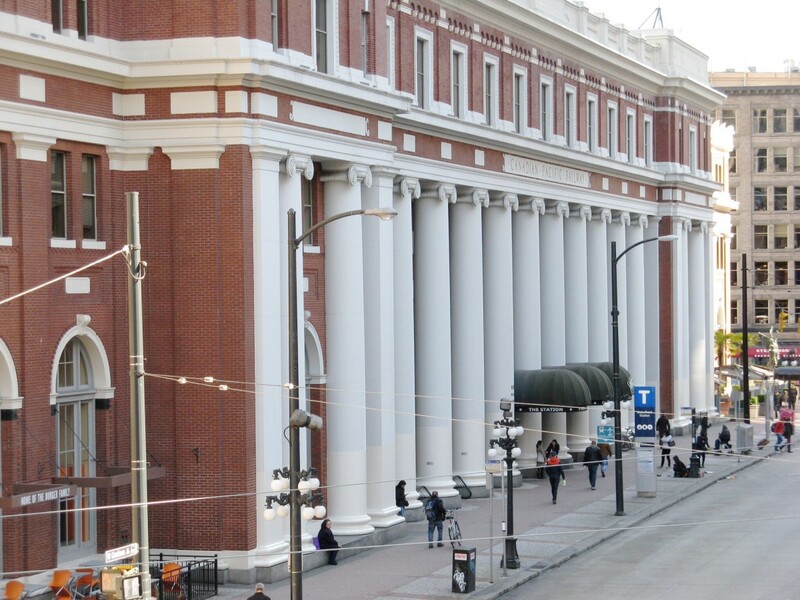 The station's ornate building used to be a Canadian Pacific Railway station. 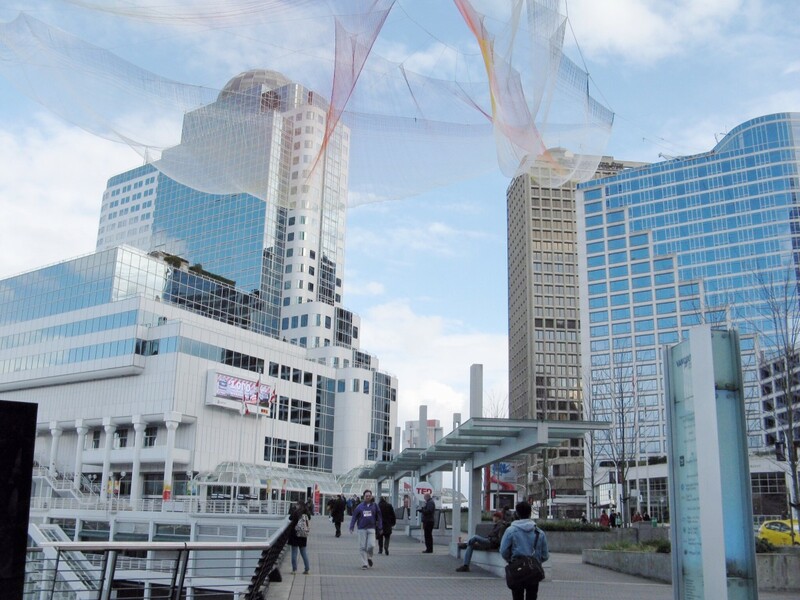 There is a lot to explore in downtown Vancouver, so a travel plan is useful. 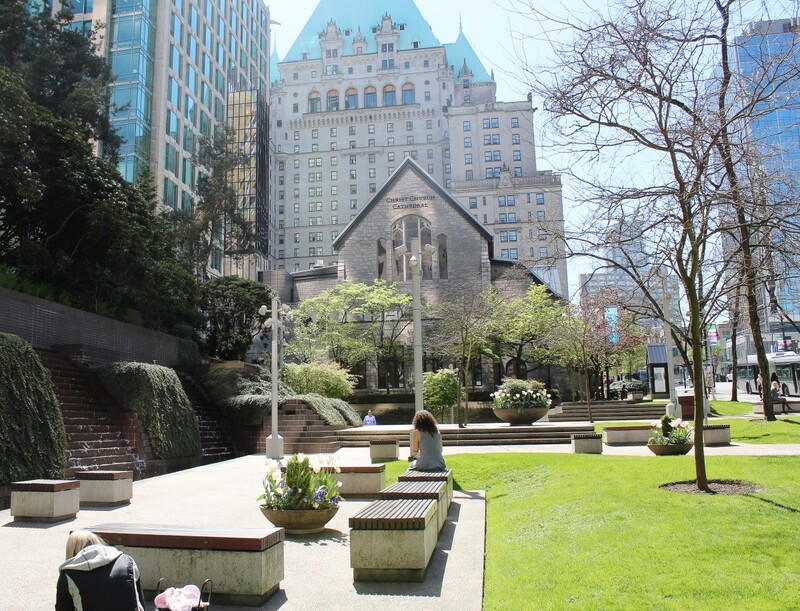 On my March and April visits I restricted my travels and photographs to Canada Place and Burrard Street, with short diversions from Burrard Street to look at nearby sights of interest. This route goes through the centre of the downtown area. Daffodils are common at this time of year. 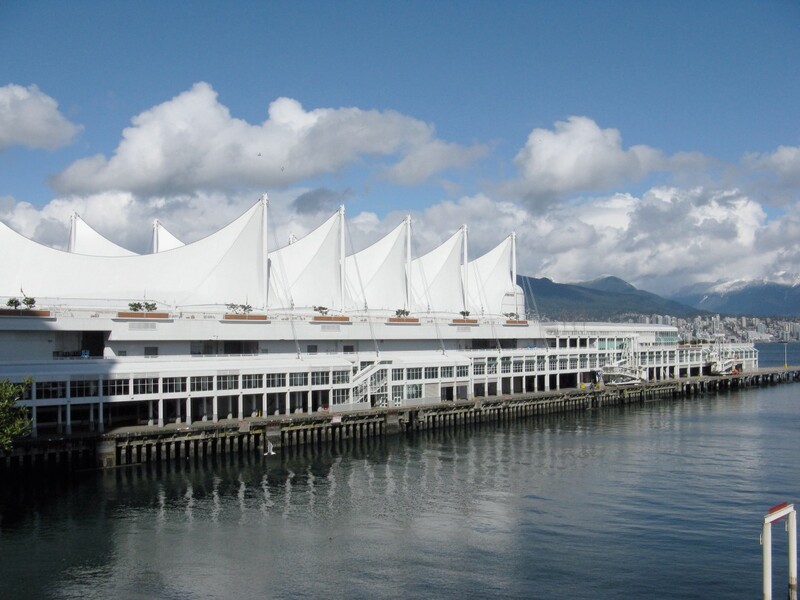 Canada Place is the name of a large and attractive pier built for business conferences, tourists, and cruise ships berths. It's also the name of the road where the pier is located. 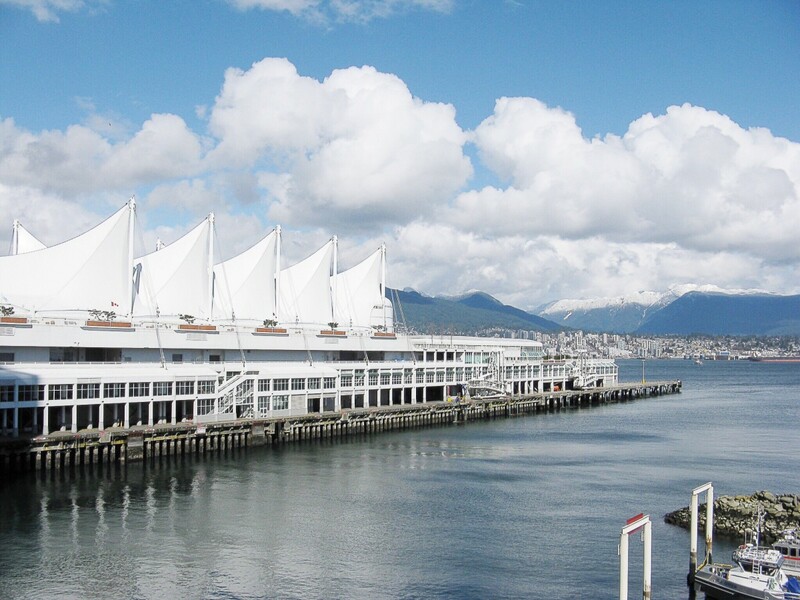 A promenade along the pier gives lovely views of Burrard Inlet, Stanley Park, and the mountains. The park is a major tourist attraction. A float plant terminus is located near the pier, so planes can often be seen taking off and landing. Flowers in containers are present on the promenade as well as an exhibition about Canada's history and geography called "The Canadian Trail". The pier is famous for its five, large white sails, which are illuminated at night. It's located next to buildings intended for businesses and exhibitions and near luxury hotels. 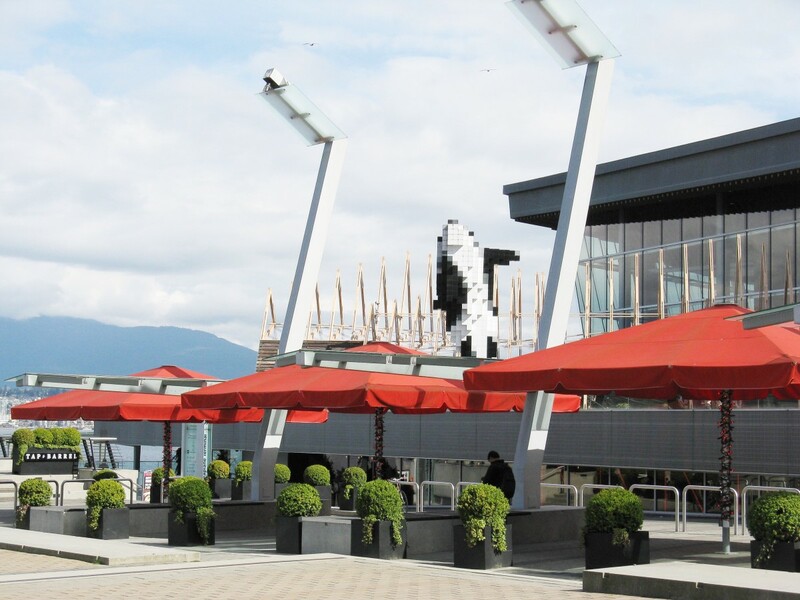 Restaurants and cafes are located on and around the pier, making it easy to get a snack or a meal when needed. 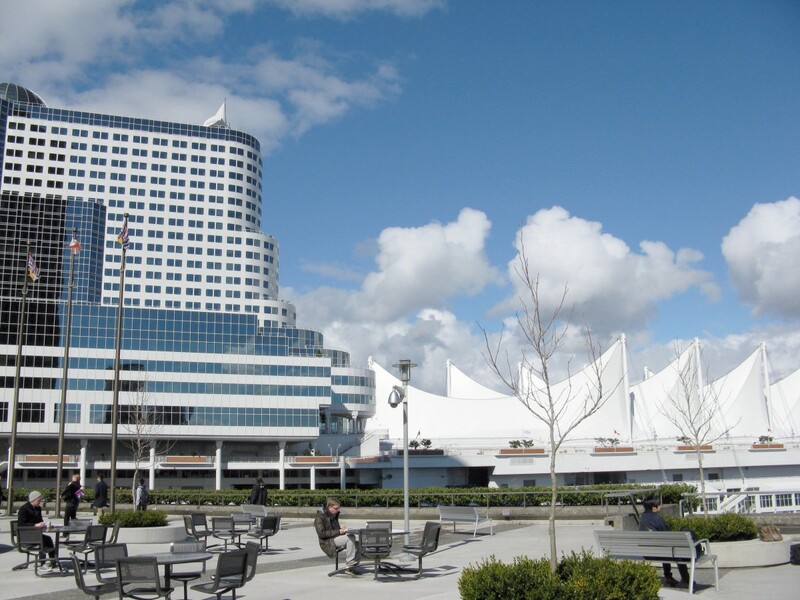 Special events take place at Canada Place throughout the year. 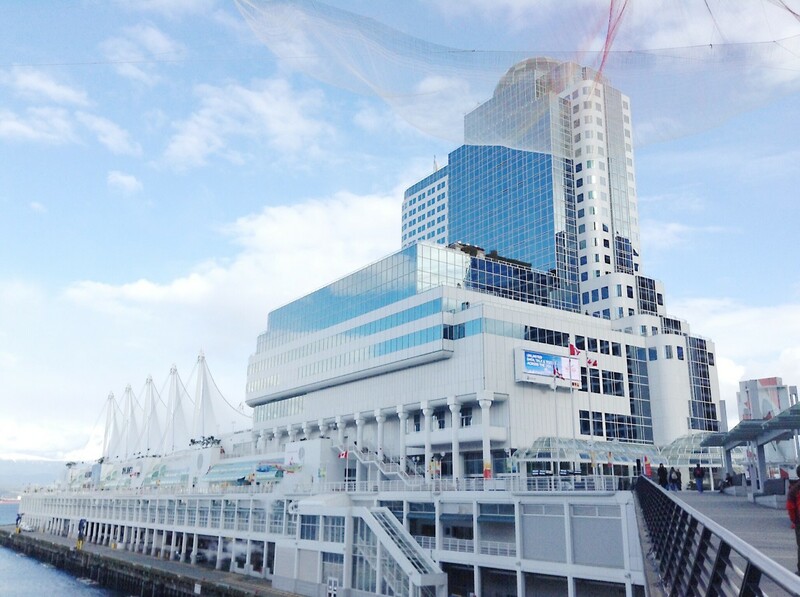 In summer, the cruise ships sailing to and from Alaska dock at Canada Place and are an added attraction. 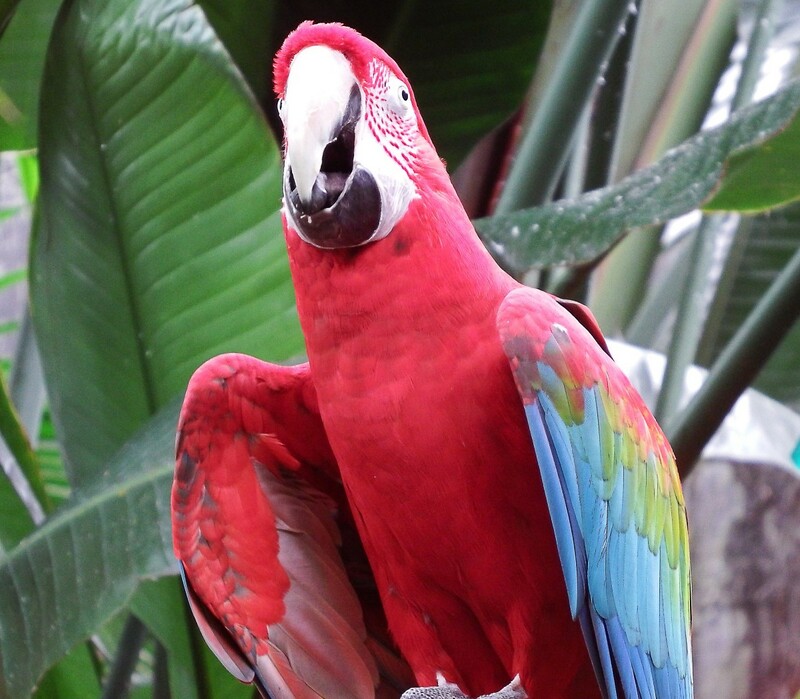 They create an impressive sight when viewed close-up. A pedestrian and bike path travels from Canada Place to the seawall path in Stanley Park. 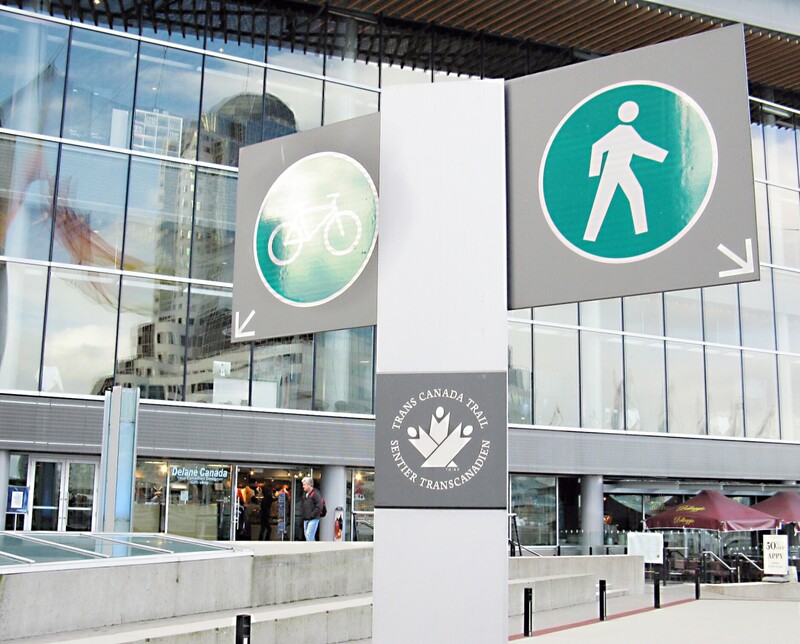 There is a walking and cycling path by Canada Place that travels beside the water and is part of the Trans Canada Trail. SeaBus takes people across Burrard Inlet and is part of the public transit system. 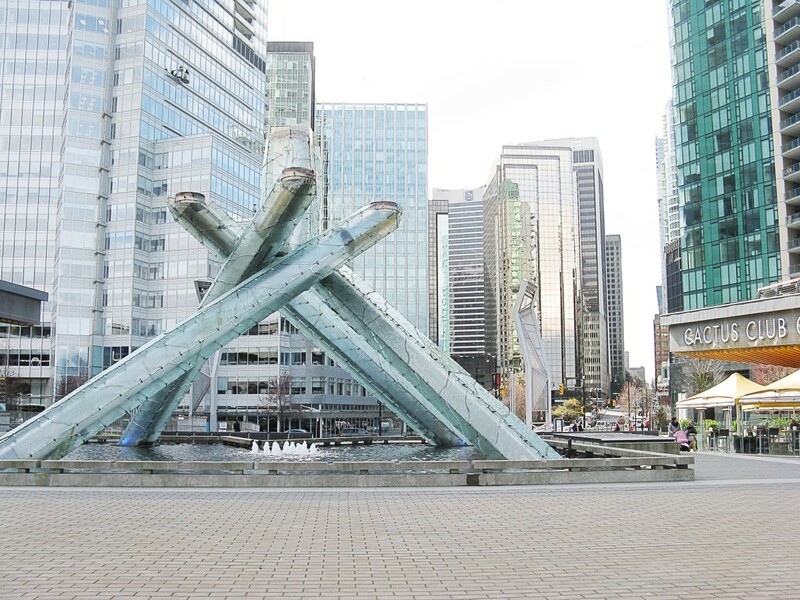 The Olympic Cauldron at Canada Place was built for the 2010 Olympics and is lit for special events. Downtown Vancouver is a vibrant place. There's often something unexpected to see. 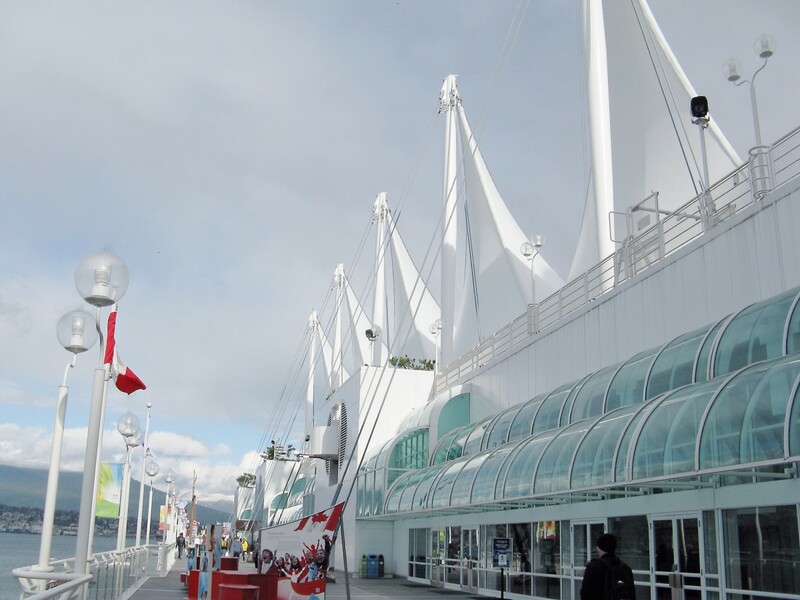 On my March visit to Canada Place I discovered that the area was hosting TED Talks. I'm interested in TED and the ideas that its speakers present, so I'm embarrassed to admit that I didn't know that this event was happening. TED stands for Technology, Entertainment, and Design. The organization says that it's a "nonprofit devoted to the spread of ideas". It believes that by sharing ideas it can change people's attitudes and even their lives. TED's focus has extended beyond the three topics represented by its name into social and global issues. One way in which the organization tries to accomplish its goals is by asking experts in different areas to give informative and hopefully inspirational talks to the public. Speakers attending the week-long Vancouver conference during my visit to the area included Bill and Melinda Gates, Larry Page (co-founder of Google), journalist Charlie Rose, Edward Snowdon (via a live video link), Sting, philosopher David Chalmers, and Chris Hadfield, a Canadian astronaut. Tickets for the events were expensive, but live and free feeds were available at places such as libraries and community centres. To accompany the TED Tallks, Janet Echelman created a large aerial sculpture made of Spectra, a fibre that resembles fishing net but is fifteen times stronger than steel. 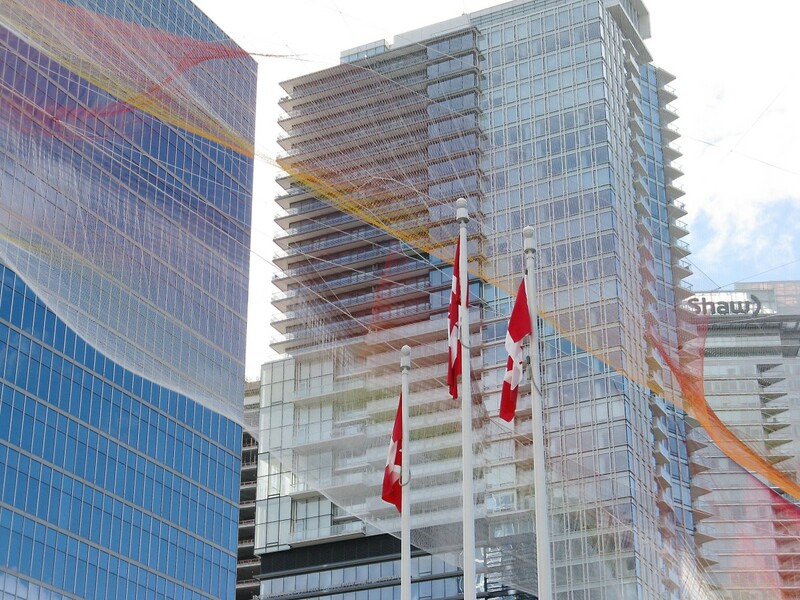 The sculpture was entitled "Skies Painted with Unnumbered Sparks", spanned 745 feet, and was attached to the top of buildings around Canada Place. During the day the sculpture changed shape in the breeze. At night it was lit by lights of different colours, as shown in the videos above. I didn't see the sculpture at night, but according to the TED website the public was able to control the lights shining on the sculpture with their mobile devices. 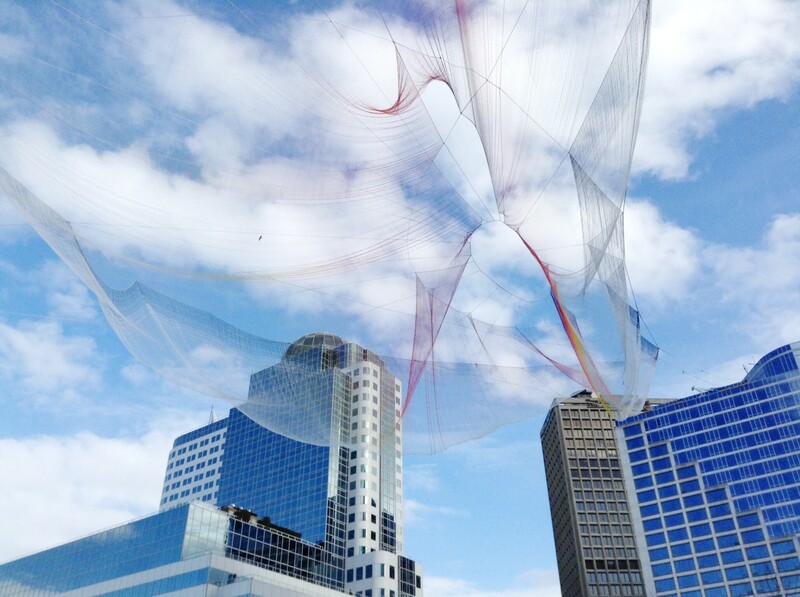 Echelman worked with a Creative Director from Google Creative Lab to achieve this goal. 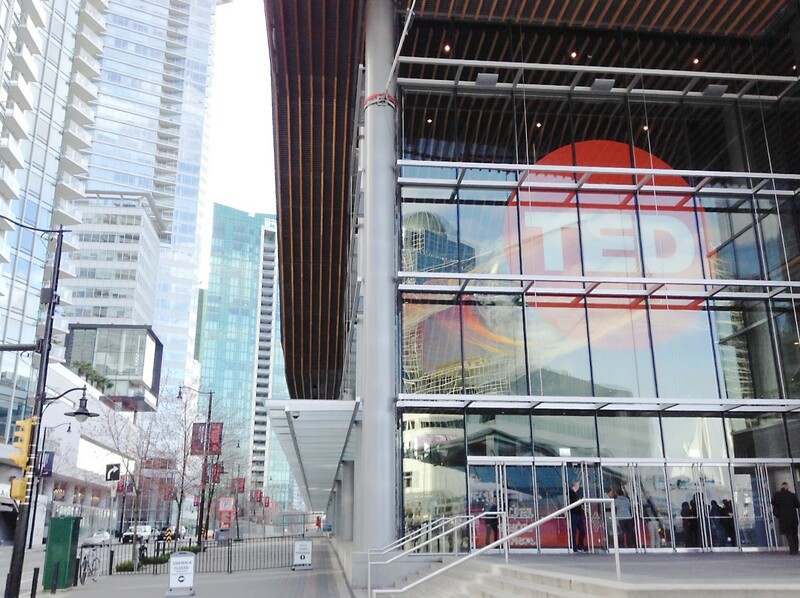 The TED conference has been held annually in Vancouver since 2014. The next one will take place from April 15th-19th, 2019. 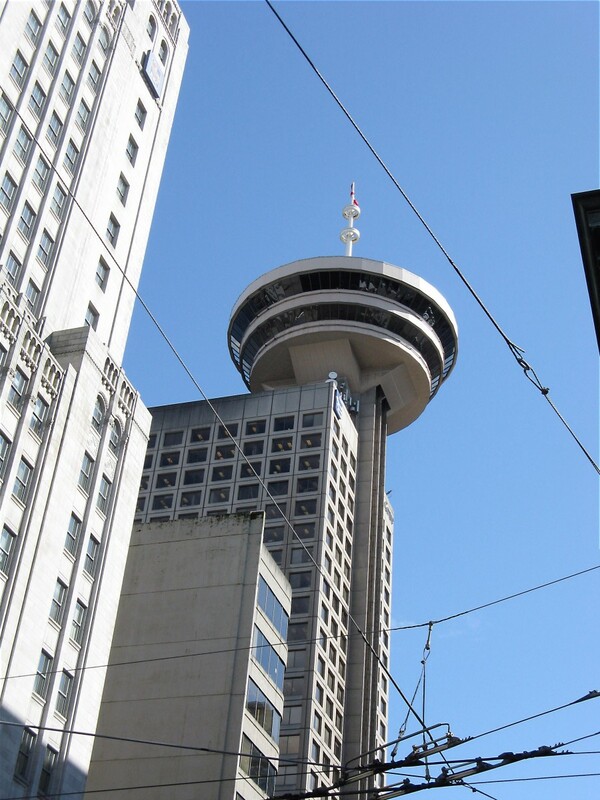 The Harbour Centre has a revolving restaurant that offers great views of Vancouver. Burrard Street between Canada Place and West Georgia Street has some interesting architecture. 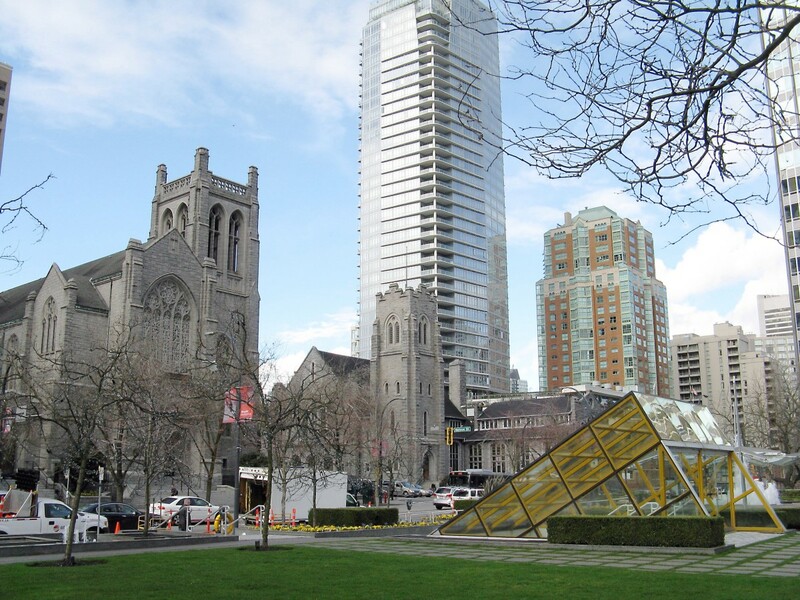 The Burrard Street SkyTrain station is located in this area and is another good entry point for an exploration of downtown Vancouver. 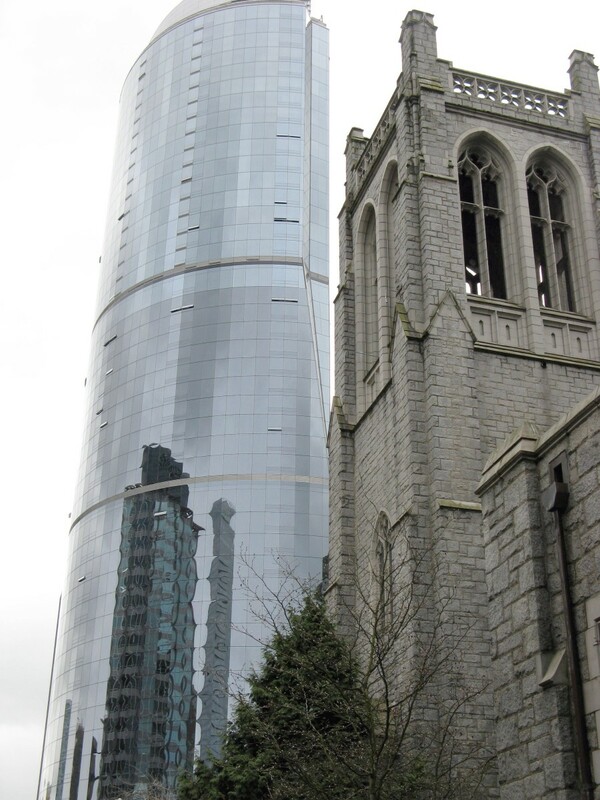 I like to take photographs of both old and new buildings in the downtown core of Vancouver. The old buildings have character while many of the new buildings reflect the area around them, which I find attractive. 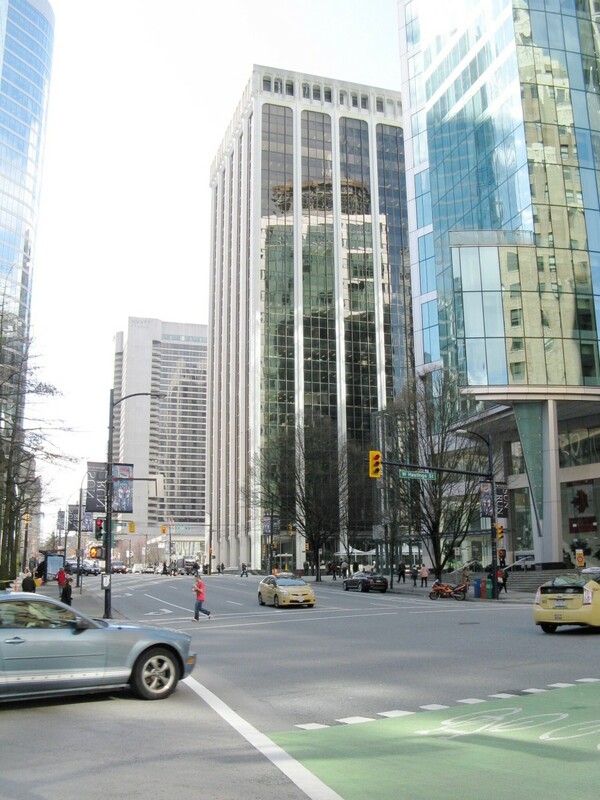 Burrard Street has both types of buildings. One of the old buildings that I enjoy photographing is Christ Church Cathedral. 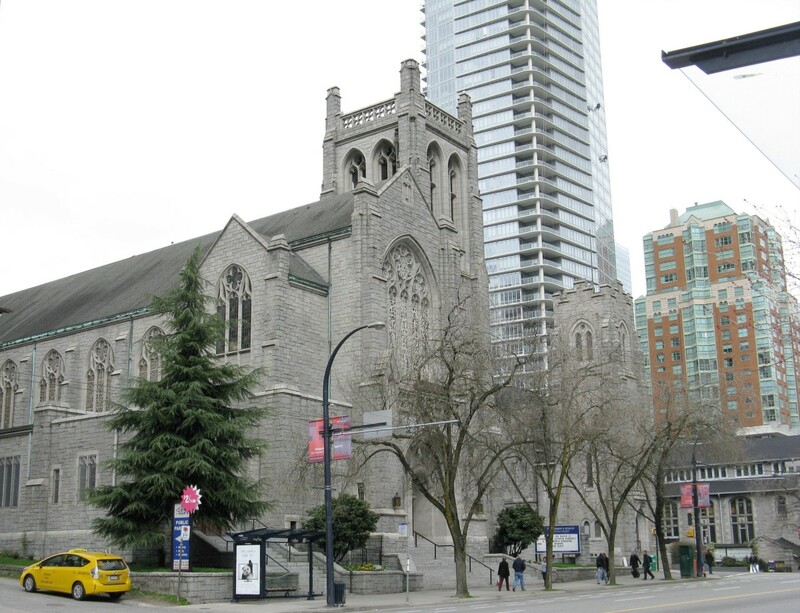 The cathedral is located on the corner of Burrard Street and West Georgia Street and is part of the Anglican Church of Canada. It was built in 1895 and has been extended since then. Holy Rosary Cathedral is another building that I like to photograph. 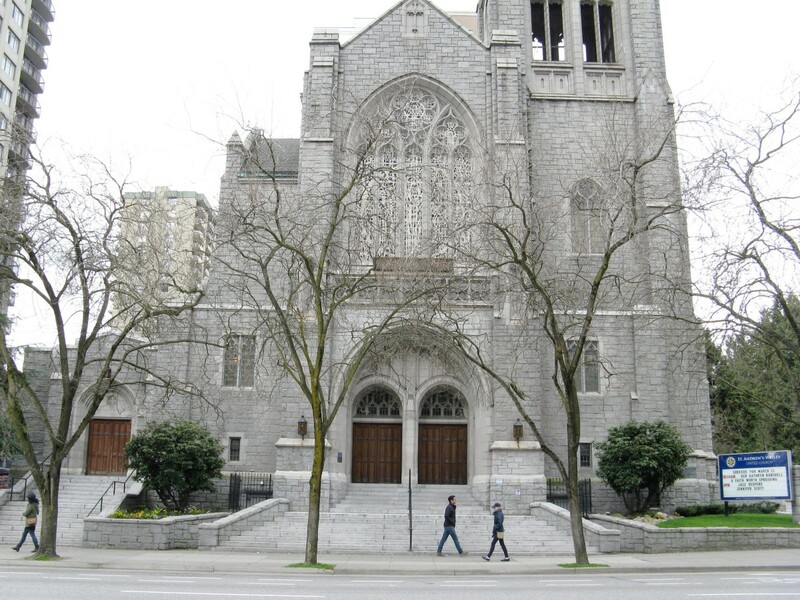 The ornate and attractive cathedral is part of the Roman Catholic Archdiocese of Vancouver. 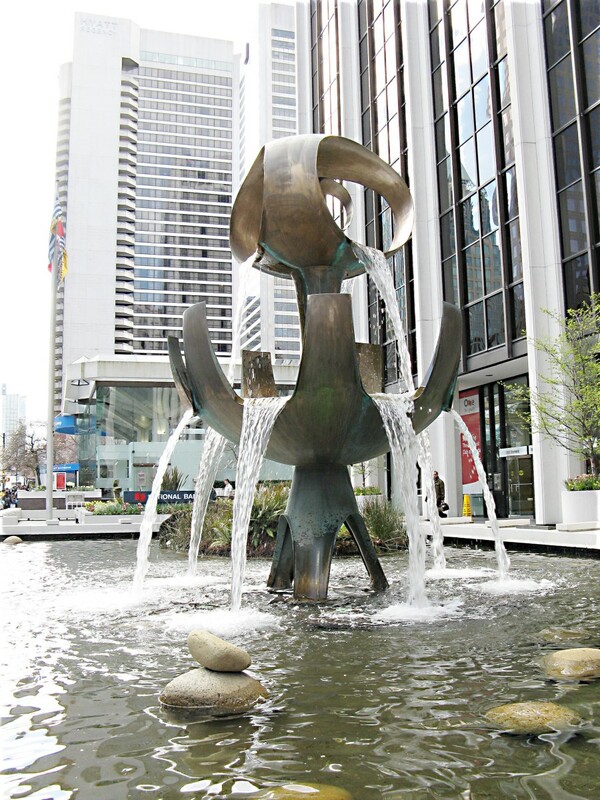 It's located in the downtown area at the intersection of Richards Street and Dunsmuir Street. The cathedral has a bell tower that creates a beautiful sound. For much of its history, Christ Church Cathedral didn't have a bell tower. A recent renovation of the roof and other areas of the cathedral created one. The bells ring every day. A bell-ringing schedule is available on the cathedral's website. 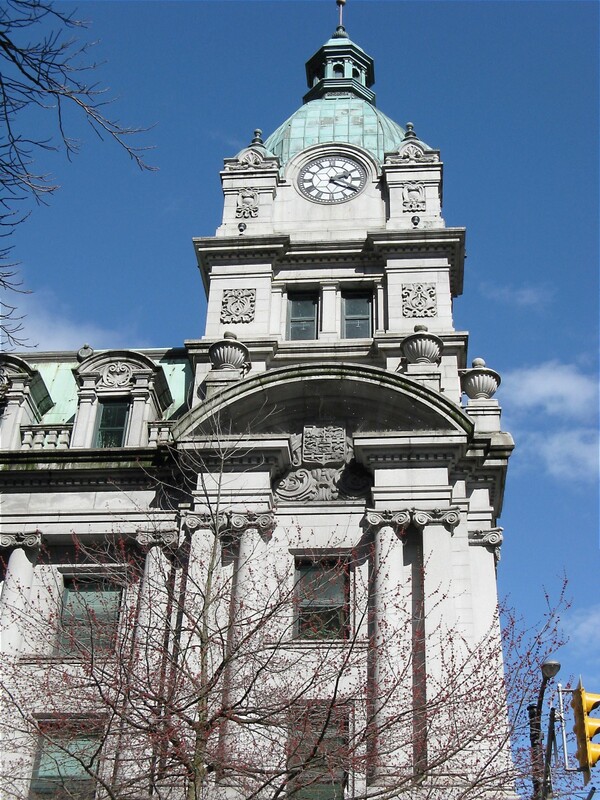 The website of the Vancouver Society of Change Ringers has a bell-ringing schedule for Holy Rosary Cathedral. Four custom bronze bells installed in the spire ring at the beginning and end of each work day, on Sundays prior to church services, in celebration of holy days, and to mark the civic events and holidays of our interfaith neighbours. 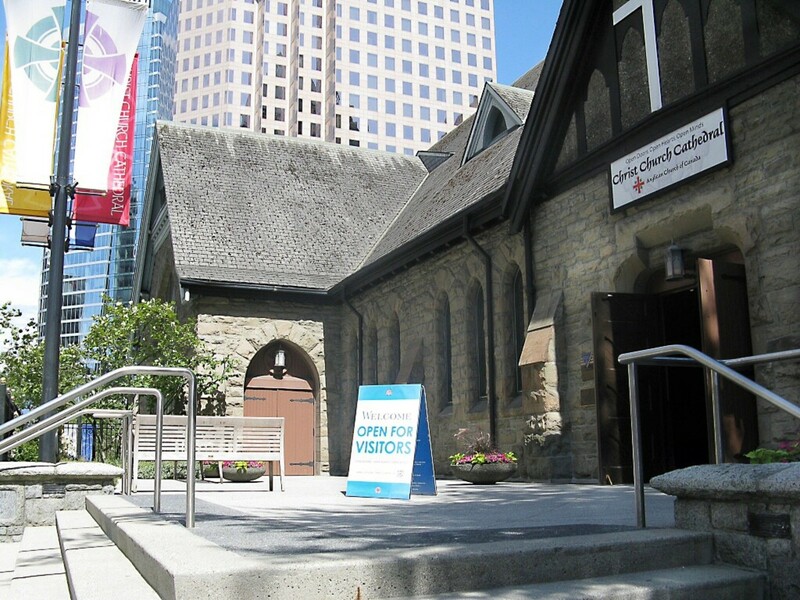 The Vancouver Art Gallery is located on West Georgia Street very near to Christ Church Cathedral. It occupies a building that used to be the law courts. The front of the building has two dignified stone lions guarding steps leading up to the door. The current gallery entrance for the public is at the side of the building, however. The area in front of art gallery steps provides an interesting view of the surrounding buildings. It once contained a large fountain, which I found attractive, but the fountain has now been removed and the area has been converted into a plaza. 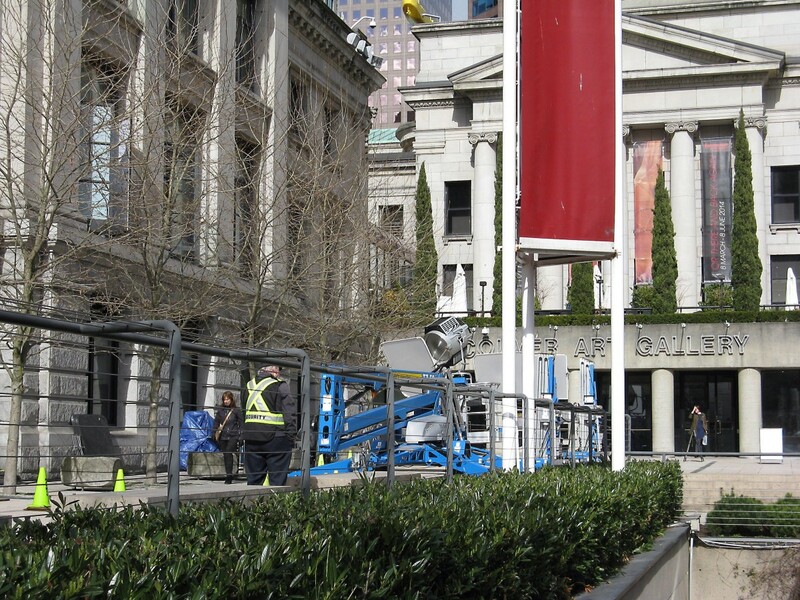 When I went downtown to take photos for this article, a movie was being filmed at the art gallery. 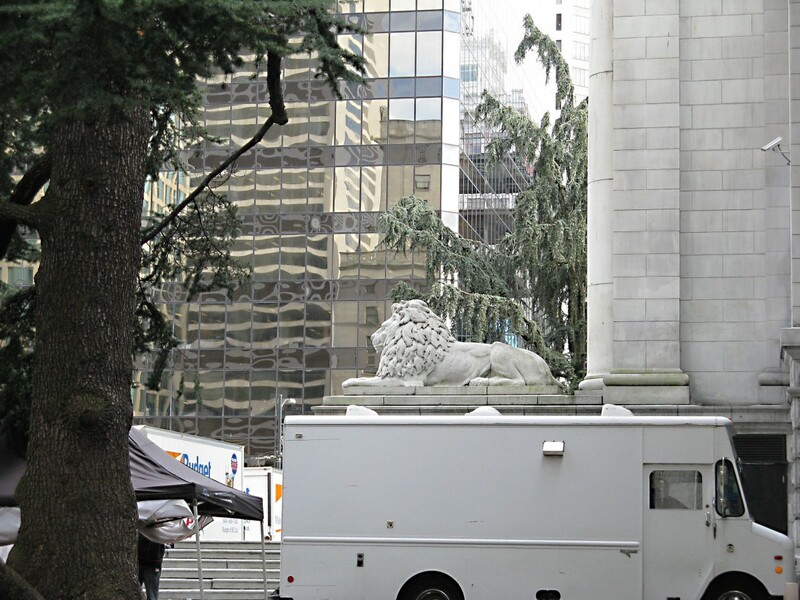 The fountain was turned off and the area in front of the steps was filled with catering trucks, other vehicles, and a large tent. At first I was unhappy about the lack of access to the area, but then I realized that there could be advantages for someone who wants to capture interesting scenes with their camera. In addition, people could still get close to the beautiful cherry blossoms located in front of the art gallery in order to admire the flowers or take photographs. 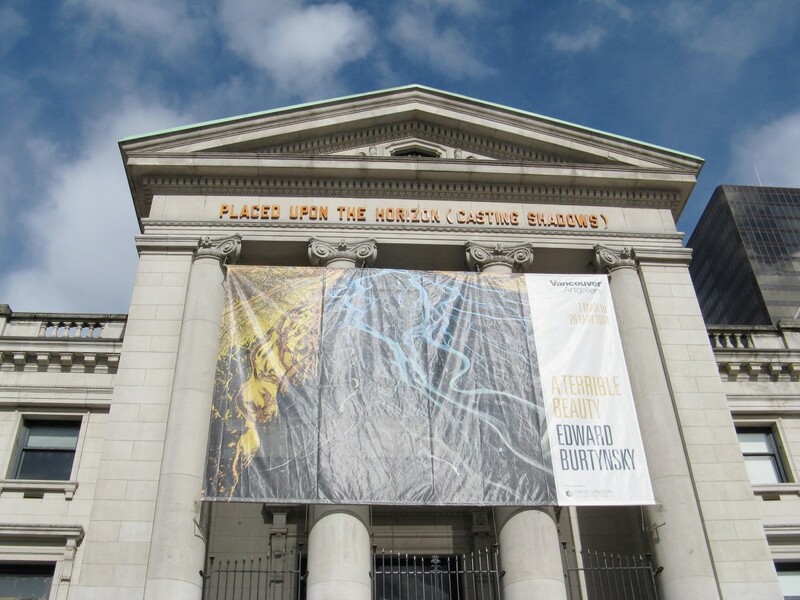 A quick search online told me that the movie being filmed at the art gallery was called The Age of Adaline and starred Blake Lively, Harrison Ford, Michiel Huisman, and Ellen Burstyn. The plot of the movie concerns a woman from the early twentieth century who stopped aging after she was involved in an accident. Her life is secretive and lonely until she falls in love with a man from the current time who changes her life. 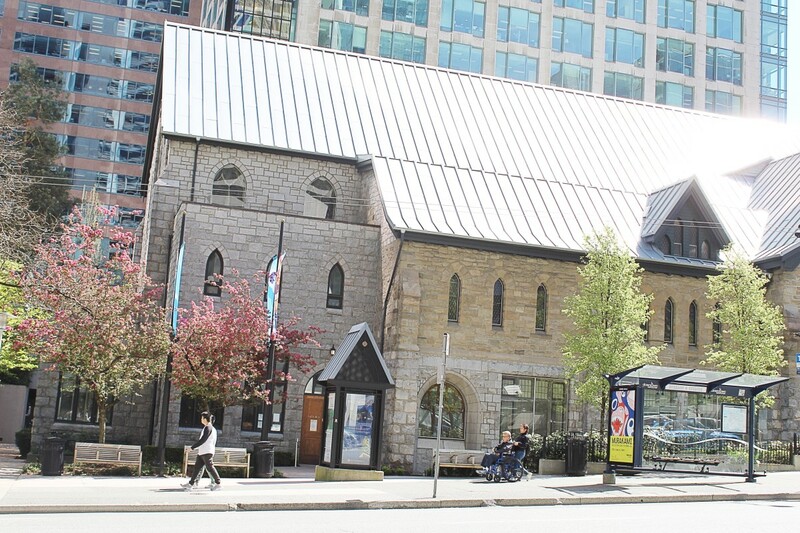 The Hotel Vancouver is located on West Georgia Street across the road from Christ Church Cathedral. It's one of the grandiose "railway hotels" established by the Canadian Pacific and Canadian National Railways in the late nineteenth and early twentieth centuries. 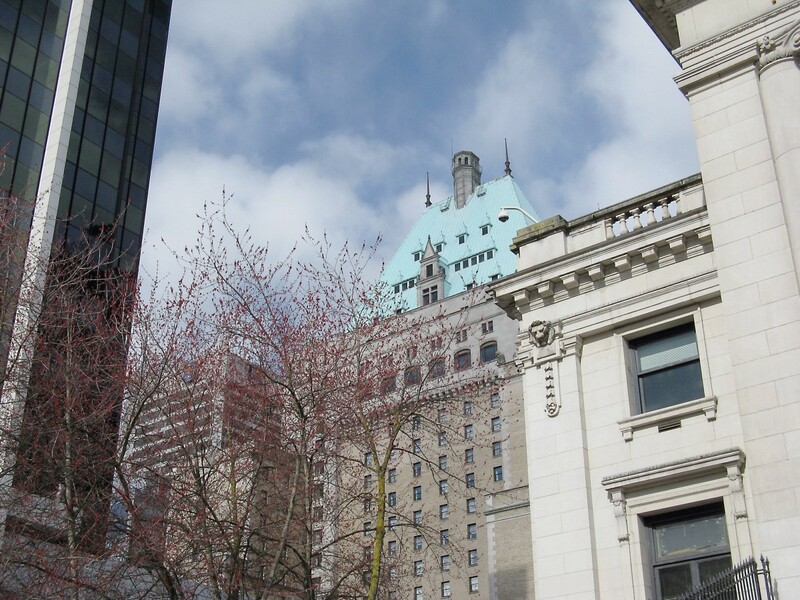 The present Hotel Vancouver building was opened in 1939. The hotel is famous for its oxidized copper roof, which is green In colour. It's an interesting building that's decorated with mythical figures, including gargoyles and griffins. 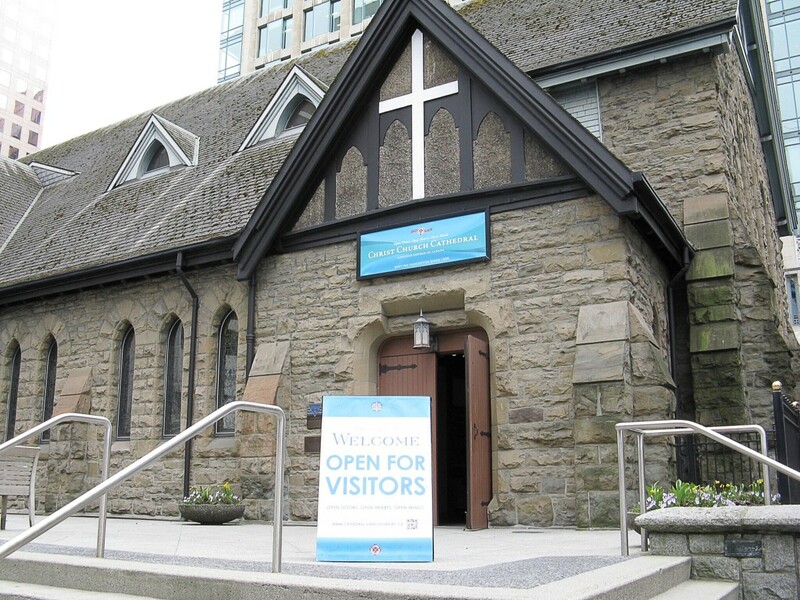 Every April, runners, walkers, and wheelchair athletes line up by the Hotel Vancouver, cathedral, art gallery. and beyond for the annual Vancouver Sun Run. This is Canada's largest ten kilometre event and attracts almost 50,000 participants. People begin the event in a wave start, with the faster participants in the first waves. Since I start in a slower wave I get lots of time to admire the scenery on West Georgia Street. 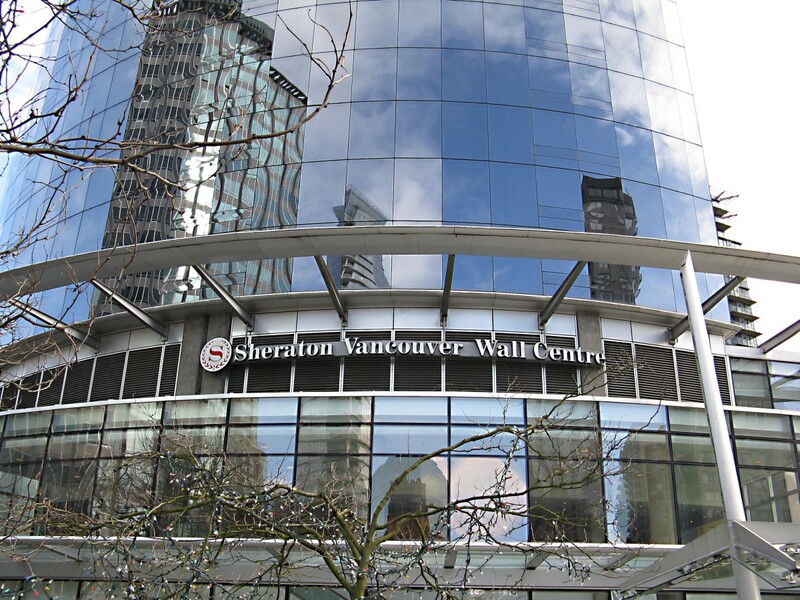 The Sheraton Vancouver Wall Centre is located on Burrard Street past West Georgia Street. It's a forty-eight storey building located in a complex with two smaller skyscrapers. 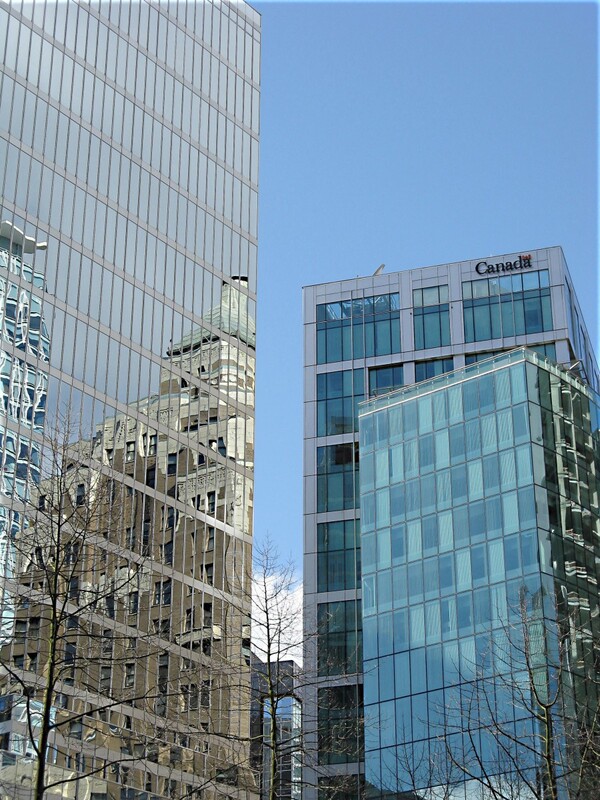 The wall centre was completed in 2001 and is named after Peter Wall, a Vancouver property developer. The first 30 floors are used as a hotel and a resort while floors 31 to 48 are residences. The rooms in the building have floor-to-ceiling windows. 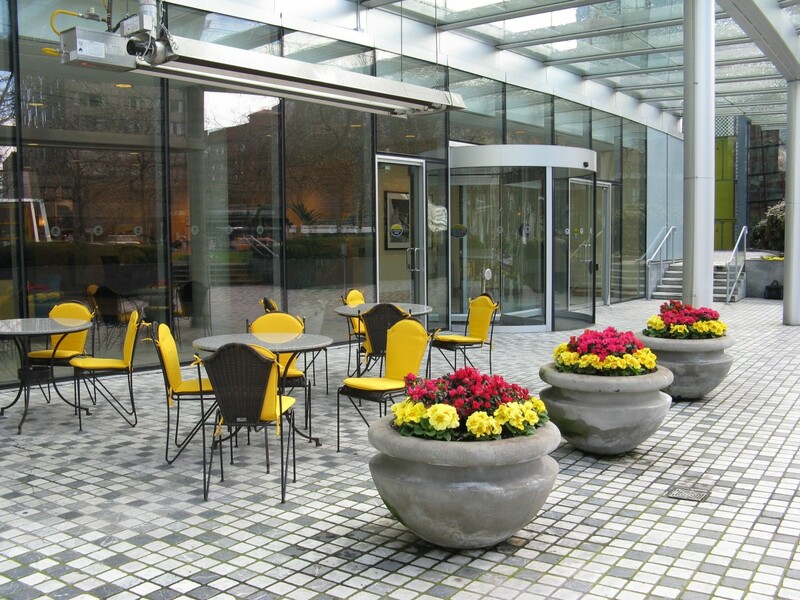 There is a lovely plaza at the front of the complex with seats, flowers, and fountains. However, the wall centre's main claim to fame as far as I'm concerned is the annual "Climb The Wall" event. In February or March, people run or walk up the stairs that climb the 48 stories of the wall centre in a competitive event. The climb raises money for the British Columbia Lung Association. A recent event had over 300 participants, including firefighters who climbed in full gear. The next Climb the Wall event in Vancouver will take place on February 24th, 2019. Until 2013 the wall centre had a surface of dark, reflective glass up to floor 30 and light glass on its upper levels. Therein lies a story. When Peter Wall was fighting to get the centre built, he wanted the windows on every floor to have dark, reflective glass. City officials objected, saying that the dark building would look like Darth Vader or the Death Star. Wall managed to get the bottom half of the centre built with the glass that he wanted. Then the city intervened. They insisted that the rest of the building be built with light glass. The result was a two-toned building. In 2011 the residents in the upper levels filed a lawsuit. They said that the glass used in the windows of the residences leaked air and moisture, which caused them to fog up. In addition, the light glass didn't block the sun's rays adequately, causing the rooms to become very hot. In July 2013 work began to replace each of the upper windows with dark glass, finally fulfilling Wall's vision. The cost was around seven million dollars. However, the original maker of the dark glass used to make the windows had gone out of business, so Wall was forced to use a different company to supply the glass. Today the building has a uniformly reflective appearance, but in some lights it still looks two-toned. 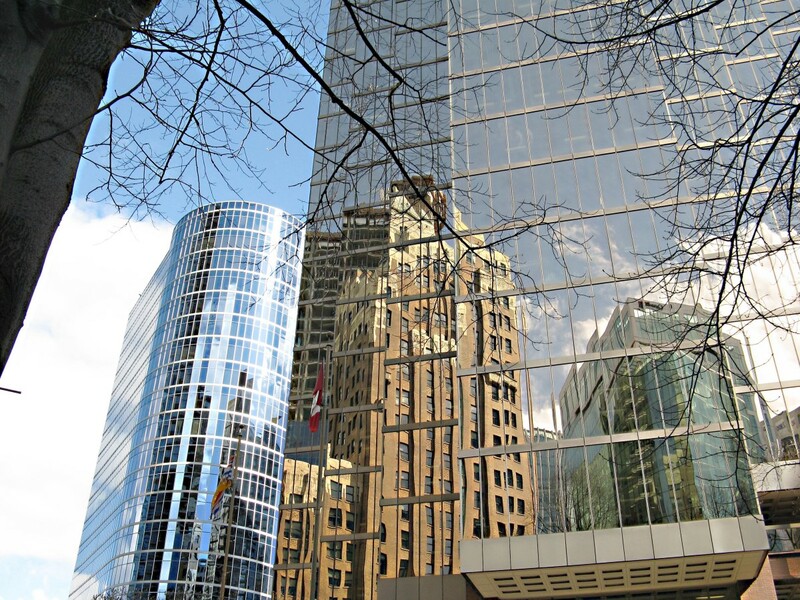 On a cloudy day, the two-toned appearance of the Sheraton Vancouver Wall Centre can be seen. 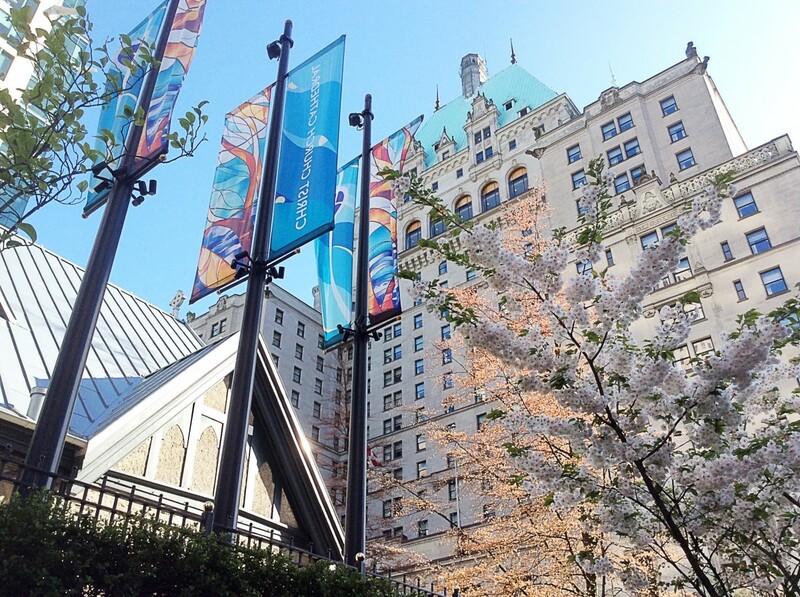 Spring is fun in downtown Vancouver because of the appearance of new plants and flowers, including cherry blossoms. According to Tourism Vancouver, the city of Vancouver has 40,000 cherry trees. Every year the Vancouver Cherry Blossom Festival is held in March and/or April. The 2018 event ran from April 3rd to April 29th. The dates of the 2019 event haven't yet been announced. Attractions and activities at the festival include concerts, dances, food, a haiku competition, painting sessions, talks by guest speakers, a Japan fair, and a Sakura illumination event. "Sakura" is the Japanese name for cherry blossom. 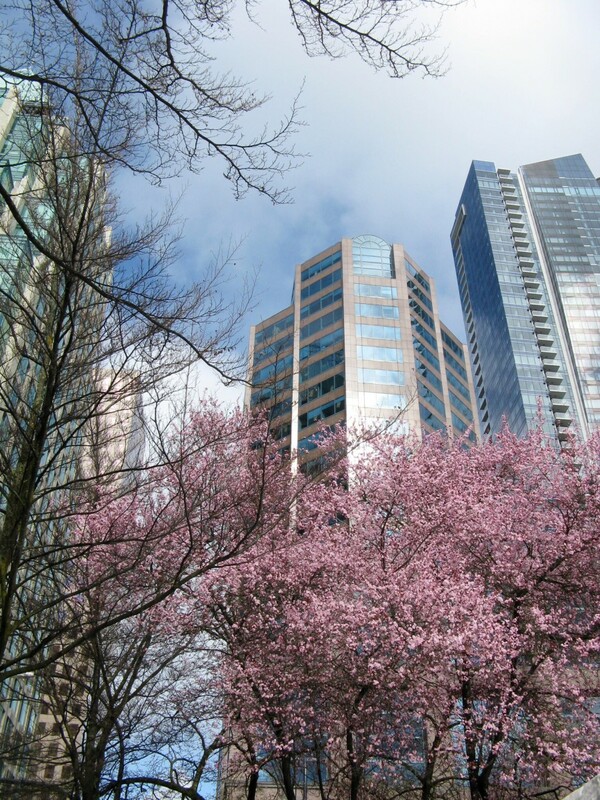 Parks are especially good places to see the cherry flowers of the Vancouver area, but they can also be seen downtown and on streets in nearby communities. 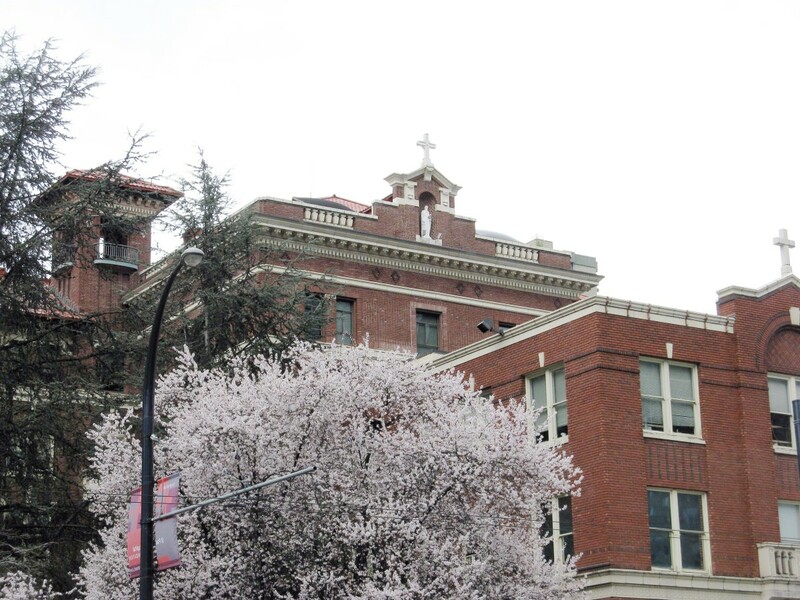 The downtown cherry flower buds have already begun to open in March. I always look forward to the appearance of the beautiful blossoms in Vancouver and near my home just outside Vancouver. I usually travel to downtown Vancouver by public transit. Vancouver is well served by buses and SkyTrain. One SkyTrain line travels from the Vancouver International Airport to the downtown area. Two additional lines travel from neighbouring communities into Vancouver. There are plenty of parking lots downtown for people who refer to drive into the city, although as might be expected the parking fees are considerably more expensive than the cost of public transit. Cycling is another transportation option. Vancouver and the surrounding cities have a network of reasonably quiet roads for cyclists as well as off-road bike paths. In the downtown Vancouver area cyclists do sometimes travel along main roads, but these roads have green, cyclists-only lanes. Some downtown bike lanes have barriers separating them from vehicles. 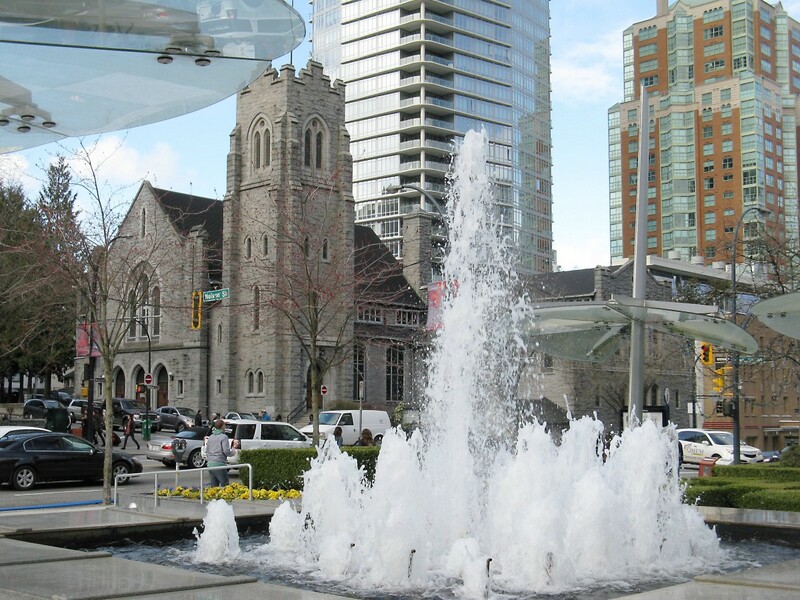 The downtown attractions are within walking distance from SkyTrain stations and bus stops for someone with normal mobility. I think that walking is the best way to explore the city. I enjoy looking at my surroundings as I walk and pausing to take photographs periodically. The TransLink website has lots of useful information for public transit travellers in Vancouver, including fare information, maps, schedules, and a handy trip planner. The trip planner tells a person how to get to their destination by public transit once they enter their starting and ending points. Once someone is in the downtown area, there are many interesting sights to see. 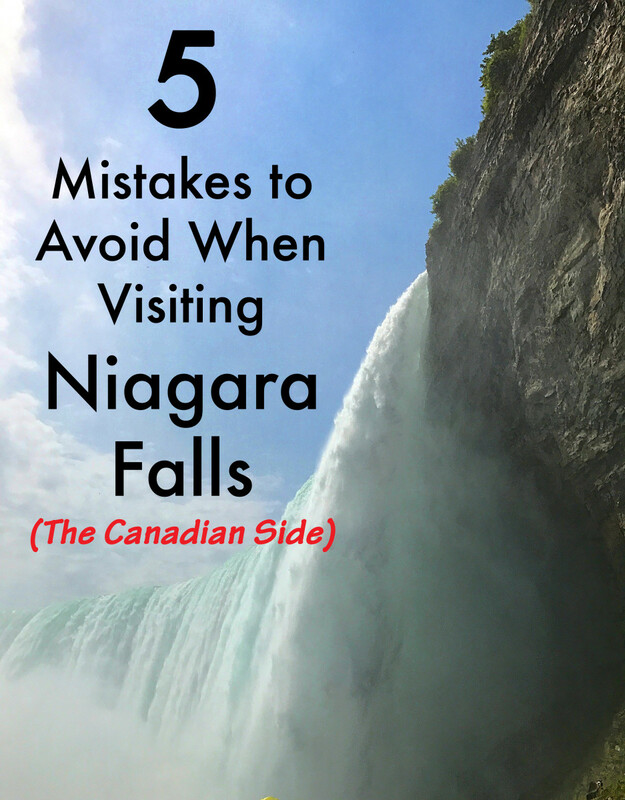 In addition, there are some great destinations to explore in the area surrounding the downtown core. Most of these can be visited by public transit, which operates throughout the Greater Vancouver area. In what part of Vancouver is the Cherry Blossom Festival held? Official events that celebrate the Cherry Blossom Festival take place in multiple areas and communities in Vancouver. 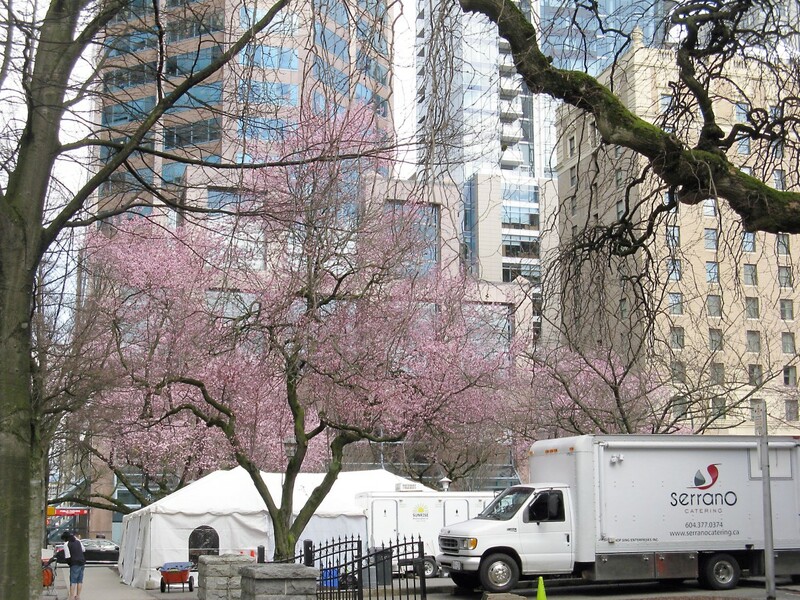 The event’s website says that Vancouver contains 43,000 flowering cherry trees and 54 cultivars. The public greatly admires them. Some examples of community events that are often part of the festival include informational tours of blooming cherry trees, a group walk or a group bicycle ride through an area with blossoms, a social media photo event which enables people to share their photographs of cherry blossoms, a Haiku competition, musical performances, events with illumination, and picnics and/or other meals emphasizing Japanese food. 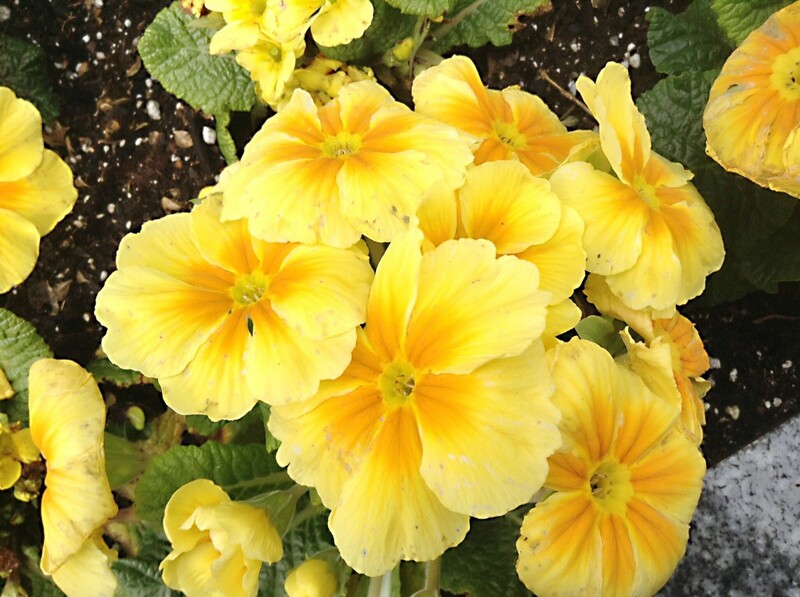 There’s usually a special event or events at John Hendry Park, Queen Elizabeth Park, the VanDusen Botanical Garden, and Stanley Park, which are all located in Vancouver. 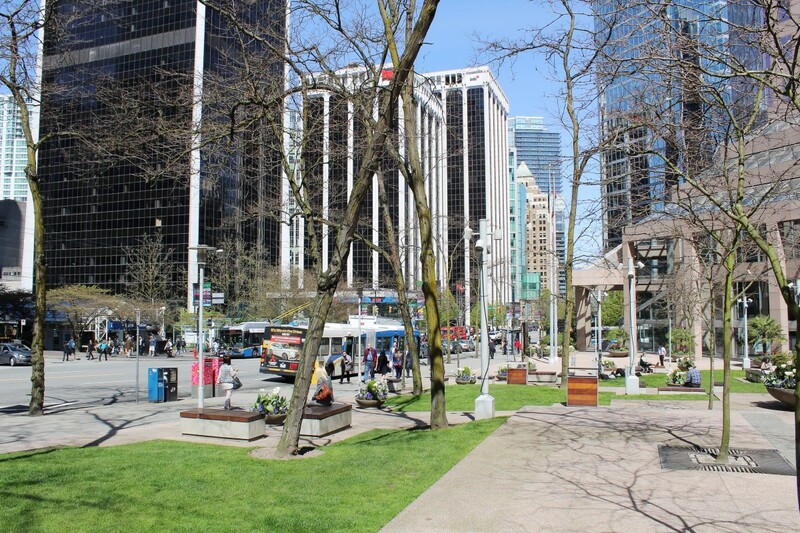 Other parks and the downtown area of Vancouver may also hold special events. Christ Church Cathedral was involved in the 2018 celebration. 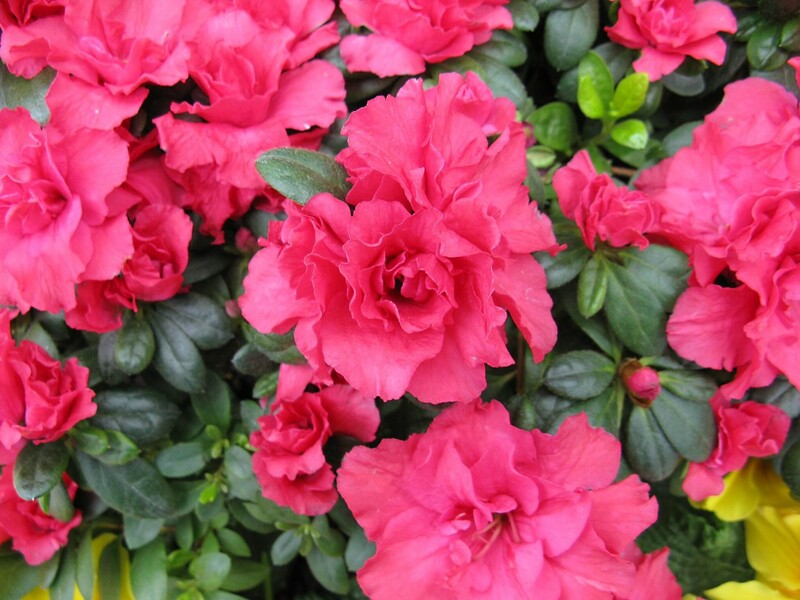 A highlight of each year’s festival is the Sakura Days Japan Fair. The event celebrates many aspects of Japanese culture, including food, music, dance, haiku, art, and crafts. A popular lantern parade is part of the fair. A ticket must be purchased to see the event, which is generally held at the VanDusen Botanical Garden. Hi, Mary. Thanks for the comment. I wish I could visit some of the places that you explore! This is really a great tour of Vancouver. There's lots of information and the pictures are beautiful. I use to go there often before when we were still working but I haven't been for years so thanks for this tour. Thanks for all the votes and the share, B. Leekley. Climate change isn't funny, but I had to laugh at your comment! I hope Vancouver is still here when you visit. Up, Useful, Interesting and shared. Now for sure I want to visit Vancouver, or maybe live in or near it, someday, if it doesn't get washed away by climate change. Hi, Mel. Thanks for the interesting comment. 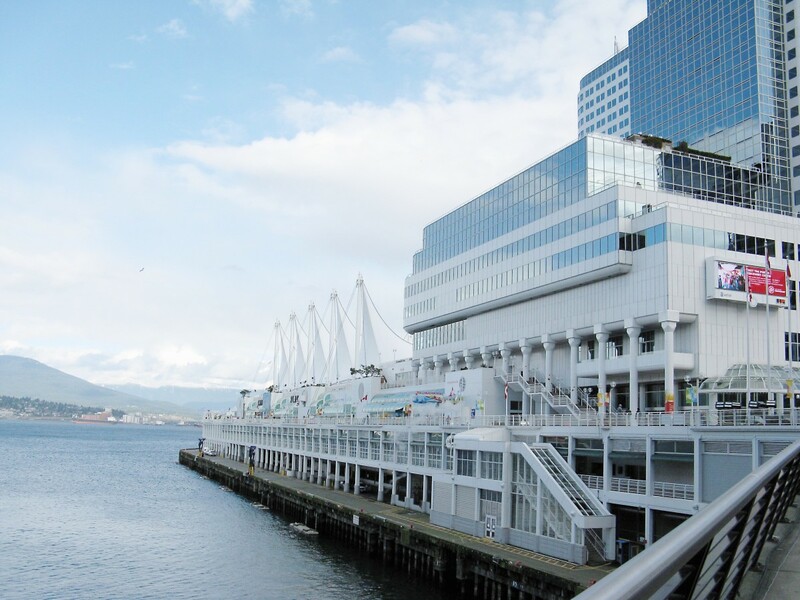 There have been a lot of changes in Vancouver since the 80s, but the waterfront has always been an important part of the city. It's nice to walk beside the water. I was in Vancouver in the mid 80s while in the US Navy. In spite of the Greenpeace protesters in the harbor the people there were wonderful and very friendly. I don't think Canada Place was there yet but I did visit the art gallery, which was very avant garde. I think I would have liked it better today, as my tastes have become more sophisticated. 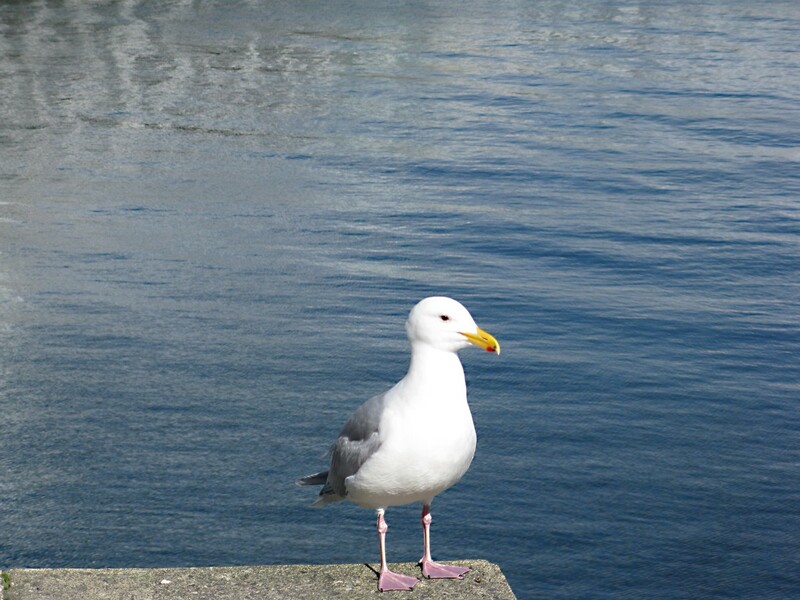 I remember taking a lovely solitary walk down by the waterfront. Thanks for the trip down memory lane. I hope you have a wonderful visit to Vancouver in July, vespawoolf! Thank you very much for the comment. We spent the day in Vancouver and would have loved more time there. I would love to see the cherry blossom festival! We plan to return in July and will hopefully have more time for downtown sightseeing. Thank you for sharing your photos and experiences. Thanks for the visit and the comment, Joe. I hope you are able to visit Vancouver one day! Beautiful sites, would love to visit Vancouver you've made it look quite beautiful and at this point it looks like a wonderful place to vacation to. Thank you very much, SEO in Vancouver! It's nice to meet someone else from the Vancouver area. This is a fantastic tour of Vancouver! I love visiting the art gallery! Thanks for the interesting comment, CrisSp. Being a flight attendant sounds like an interesting job. The travel opportunities must be great! Love Vancouver! Been there a few times and I remember since becoming a Flight Attendant, this was my first destination and from there to Cancun, Mexico. Nevertheless, I'll never get tired of it. I love the ferry ride within the city and the Fish market....hmm...fish and chips! I think I'm more likely to be there again in the summer. Thank you very much for the pin, ologsinquito! I hope you're able to visit Vancouver some day. It should be an enjoyable trip. I can't wait to hopefully see Vancouver some day. This is pinned to my See the World board. 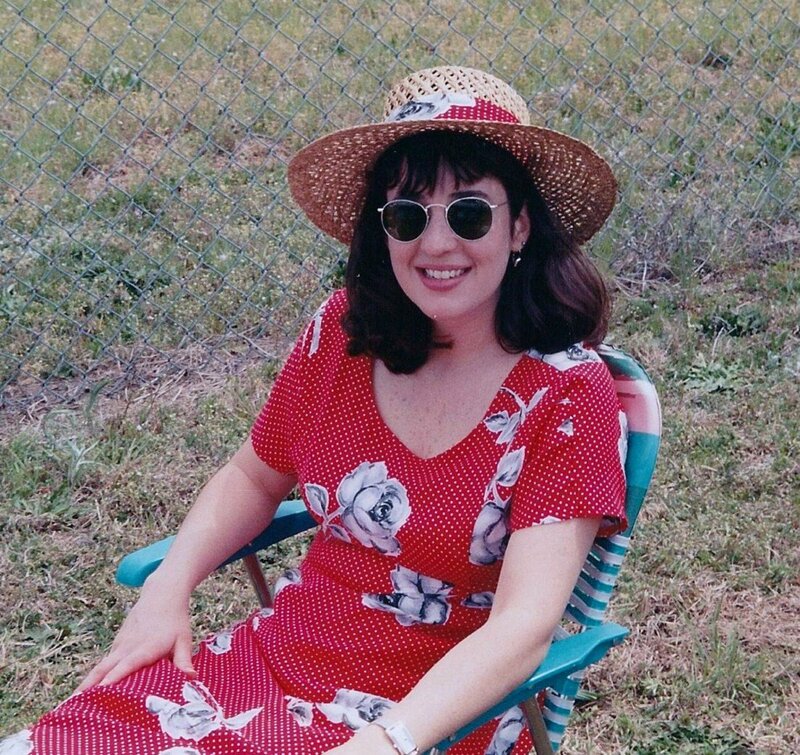 Hi, Deb. Yes, Vancouver is a very interesting place to explore. 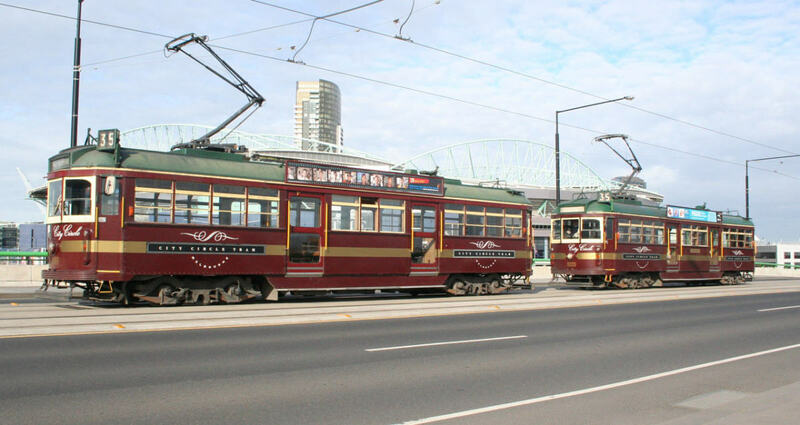 There's lots to see and do in the city. Thank you for the comment! This was a great synopsis on many of the wonderful things that Vancouver has to offer. I also enjoyed your last piece on the Vancouver parks, which naturally interested me as a birder. This area seems to be as interesting as Toronto. Thank you for the kind comment, Treasuresofheaven. I appreciate your visit. I'd love to see your photos of Maui! You did a spectacular job in photography. I am inspired to showcase some of my photos of Maui. My husband and I vacationed earlier this month in West Maui Hawaii. Never been to Vancouver though! Simply beautiful. Thank you very much for the comment, BernietheMovieGuy. There are so many places that I'd like to visit but doubt that I ever will, but as you say, who knows? Maybe I'll be able to see some of the places some day! Thanks for the vote and the follow. Thank you, Crafty. I appreciate your visit! 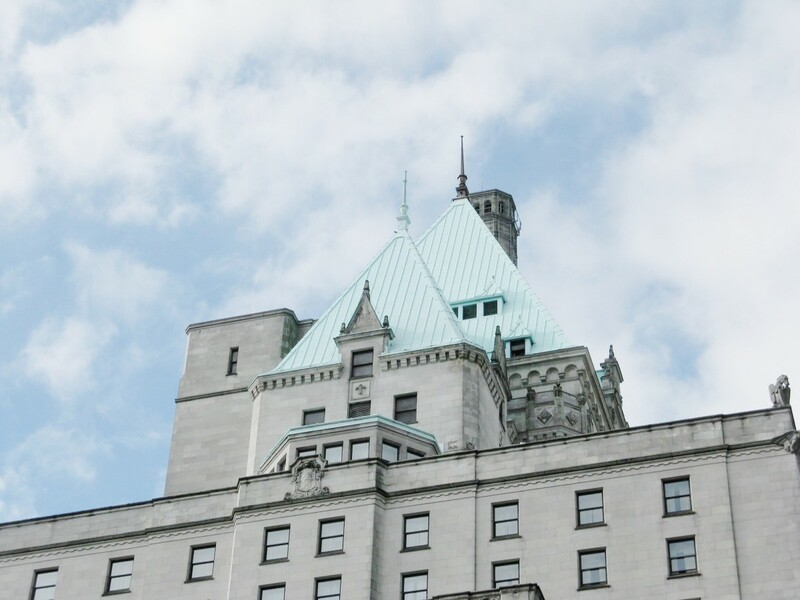 Beautiful pictures and walk-through of Vancouver. Thank you very much for the comment, VioletteRose. Vancouver does have some beautiful areas! Thank you very much, Writer Fox! I appreciate your comment and vote. What a beautiful city! I loved the pictures of the cherry trees in bloom. Voted up and enjoyed. Hi, Cotswold-G. Thanks for the comment. Yes, Vancouver is a nice city. I'm happy to hear about another fan of reflection shots! I like those reflection shots. I'm a fan of those myself. Been to YVR a few times but not recently. Nice city. Hi, Crystal. Thanks for the visit. I've visited places that I wished I could have stayed longer at, too. I went on a trip to Spain with some students from my school and on the way home was able to spend half a day in Germany. Spain was lovely, but I wish so much that I could have spent longer in Germany, especially since I may never visit the country again! I spent one afternoon and evening in Vancouver years ago and always wished I'd had more time. It is a lovely city. Thanks, Thief12. For many of us, there are so many places in the world that we'd like to visit and just not enough money or time to visit them all! At least we can explore the world via the Internet. Really beautiful pics. Wish we could go there some day. Hi, Jodah. Thank you very much for the visit and the kind comment. I would love to visit Australia and New Zealand as well, where I have relatives, but sadly I doubt whether either trip will happen. It's nice to daydream, though! What a wonderful hub, full of lovely photos and information about Vancouver. If I could ever afford to and choose where to visit in the world I think Canada would be one of my first choices. Thanks for sharing Alicia. Thank you very much for the comment, the vote and the share, Bill. I'm glad you got to see Stanley Park and Grouse Mountain on your visit to Vancouver. Those are both lovely areas. Hi Linda. Great look at the wonderful city of Vancouver. We were there once a few years ago for two days. Spent one day at Stanley Park and Aquarium, and one day up Grouse Mountain. Looking back I wish we spent more time in the city. I remember the white sails on the Pier and wondered what that was all about. Hi, ologsinquito. Yes, Vancouver is a fun place to visit and to explore. Thanks for the visit! I've been reading a lot about Vancouver lately. It looks like a fun place to visit. Thank you very much, NathaNater! I appreciate your visit and your comment about the photos. Hopefully you'll be able to come to Vancouver one day to explore the city yourself. I've heard Canada has some of the most beautiful cities in the world. Canada Place looks amazing, I'd love to visit it. 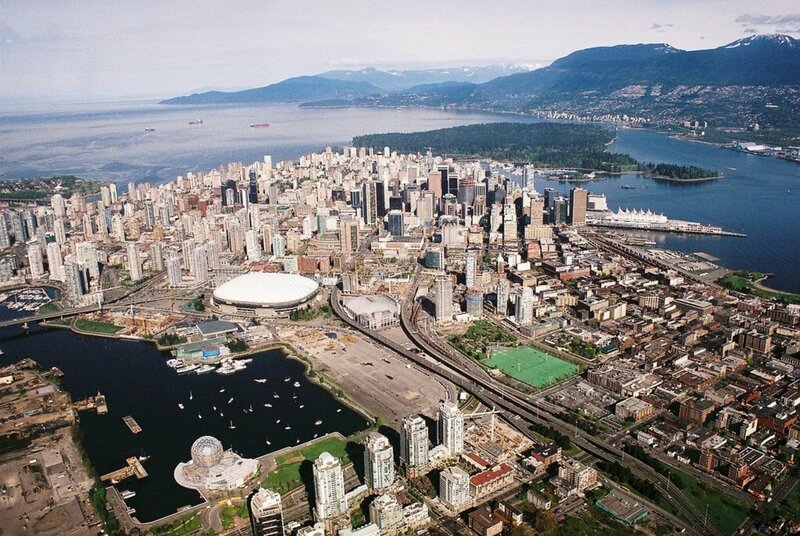 Definitely would like to visit Vancouver some day, looks like an amazing city with plenty of things to do there. Your photos are fantastic! Thanks for sharing. I've wanted to go on a whale watching tour for a long time. I've never been on one, though. I really must take advantage of the opportunity soon! Thank you very much for the visit and the comment, Cynthia. Thank you very much for the lovely comment, Pamela! I appreciate it. Vancouver has been on my bucket list for a long time. You did a beautiful job of showing the sites, telling us about the city and the pictures are all beautiful. I thoroughly enjoyed your hub. Awesome! Hi, WriterJanis. Thank you for the visit and the comment! Thank you very much for the comment, Eddy! I appreciate all your votes, too. I hope the week ahead is a great one for you. I have briefly been in Canada, but not here. Judging from what you wrote, there are many interesting places to visit. Your pictures really brought everything to life. Thank you for this wonderful tour Alicia. Voted up, awesome , beautiful and interesting. Thank you for the comment, tirelesstraveler. Victoria is a lovely city, too! I enjoy my visits there. It just occurred to me the last few times I have been to BC I only visited Victoria. Thanks for reminding me how beautiful Vancouver is. Thank you very much, epbooks. If you visit Vancouver again, I hope you're able to stay for longer! I visited there once but only for two days or so. It was beautiful. I believe I stayed at the Wedgewood. I'd definitely go back. Great post! Thanks, DDE. I appreciate your comment! Thank you, Edward J. Palumbo. I'm glad that you liked Vancouver when you visited the city. Hopefully you'll be able to visit again! A beautiful hub indeed the flowers are so colorful and now I have an interesting insight of the lovely place. I enjoyed this article very much! I enjoyed my last visit toVancouver and look forward to a return trip. Interesting and well illustrated! Thank you so much, Faith. I appreciate your kind comment and all your support. 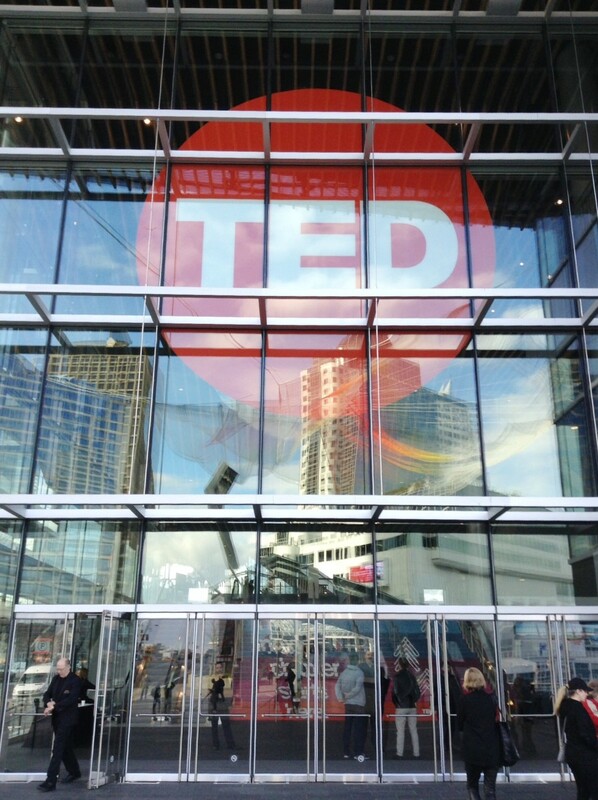 Yes, it was interesting to be in Vancouver when the TED Talks were happening! I hope the rest of the weekend is wonderful for you, too, as well as the week ahead. 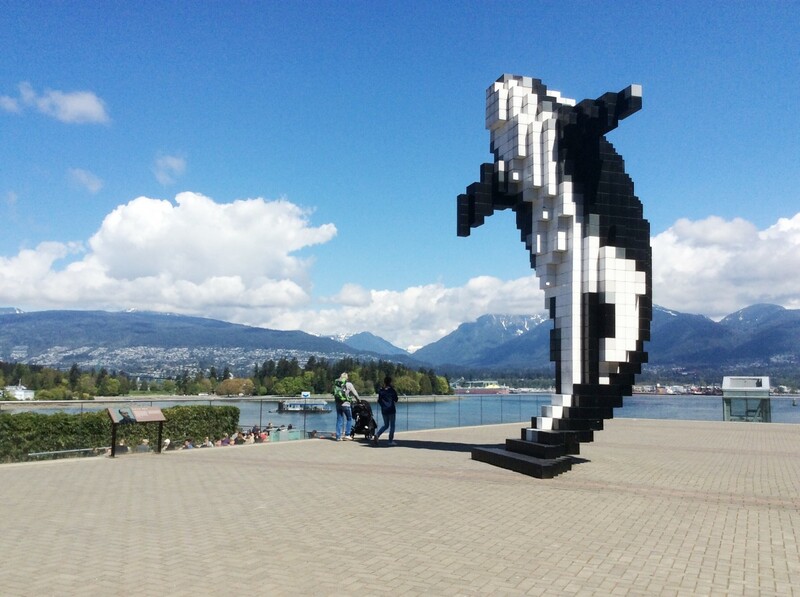 Thank you for taking us along on your lovely tour of Vancouver in Spring! I truly love cherry blossoms. Your photos are gorgeous. If I were to ever visit Vancouver, I would want to do so in Spring. That was a nice coincidence that the TED Talks event happened to be taking place when you visited! 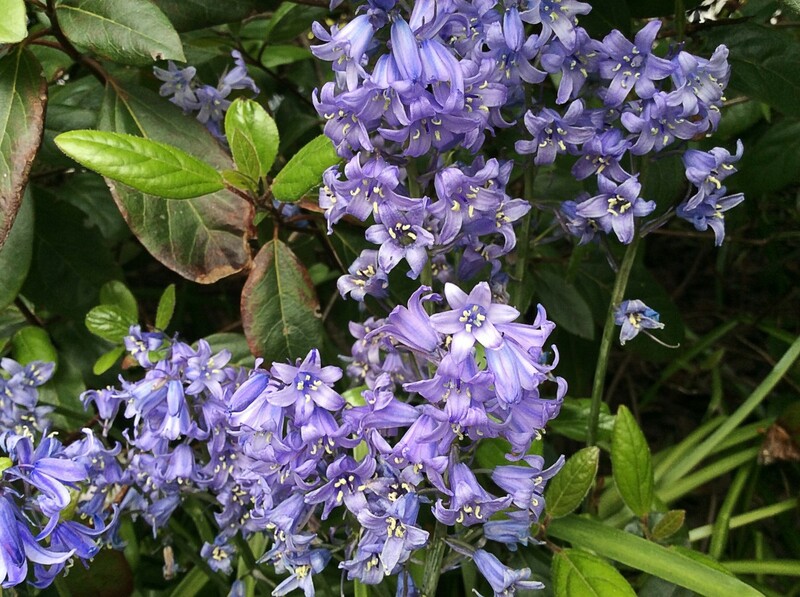 Your photos of the buildings, flowers, trees and cathedral are exceptional. Thank you for the kind comment, MJ! I appreciate your visit and the comment very much. What a lovely virtual visit I just had, thanks to your hub. I appreciate the photos of the gorgeous flowers (our wildflowers have not yet made their full appearance, and cultivated flowers wouldn't stand a chance in our area thanks to the rodent and insect life). 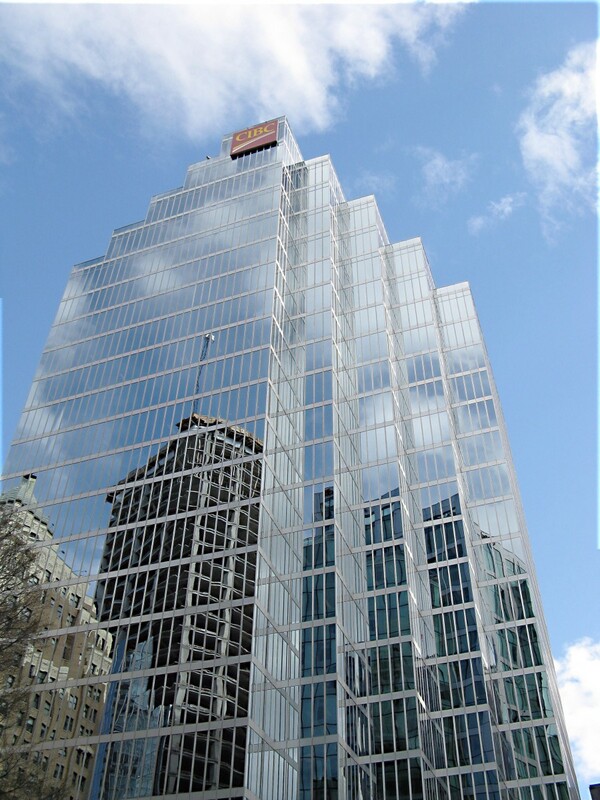 Your building photographs are outstanding -- such a great eye for perspective and reflection! Thanks for the armchair tour! Thank you very much for the visit and the comment, Bill. Yes, Vancouver is a lovely city. Like most cities, it has its problems, but it also has a great deal of beauty. It's been a long time since I was there, and I see it is still a beautiful city. Thank you for the tour my friend.